Cars 269 and 1736 pass. One car is signed for route 52 – Kedzie; however, the slide says this is 2800 W. Chicago Avenue. The date is May 4, 1952. Andre Kristopans writes, “CTA 269 and 1736 are indeed at 2800 W Chicago Av. 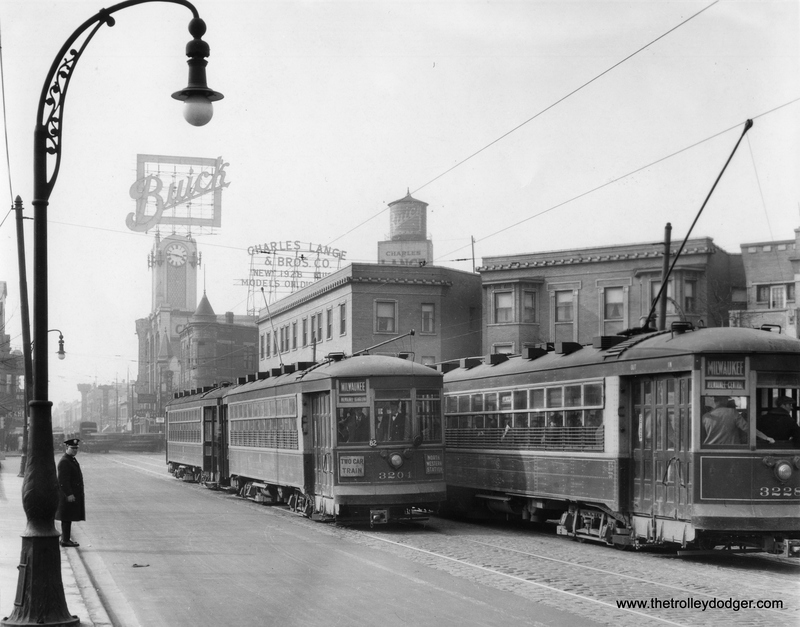 52 cars used four blocks of Chicago to go between California and Kedzie. The left-hand turnoff to go north on California is right in front of 1736.” Natale “Nick” Colletti’s grocery store at 2804 West Chicago Avenue is at left, with the Quality Market and Coffee signs. Editor’s Note: The purpose of this blog is to make connections with other people, because we are all connected to each other. The stories and images of the past help enrich our lives in the present, and the lessons learned will help us in the future. Often these connections are made in unexpected ways. This post is one example. 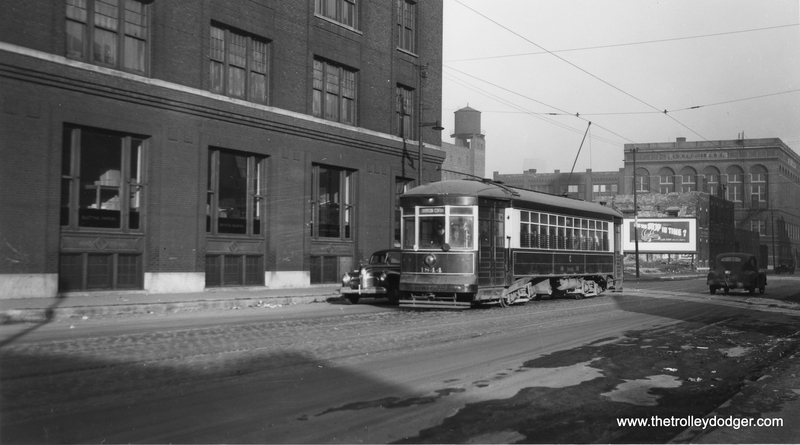 One of the images in our post Chicago Streetcars in Color, Part 2 (March 9) caught the attention of John Tenuto, our guest contributor for today. His grandfather’s store was one of thousands of such markets in Chicago’s many and diverse neighborhoods. His story is emblematic of many such immigrant success stories. We should never forget how the dedication and hard work of people such as Natale “Nick” Colletti has helped make America great and a beacon to the world. My name is John Tenuto, a sociology professor from Gurnee, Illinois. 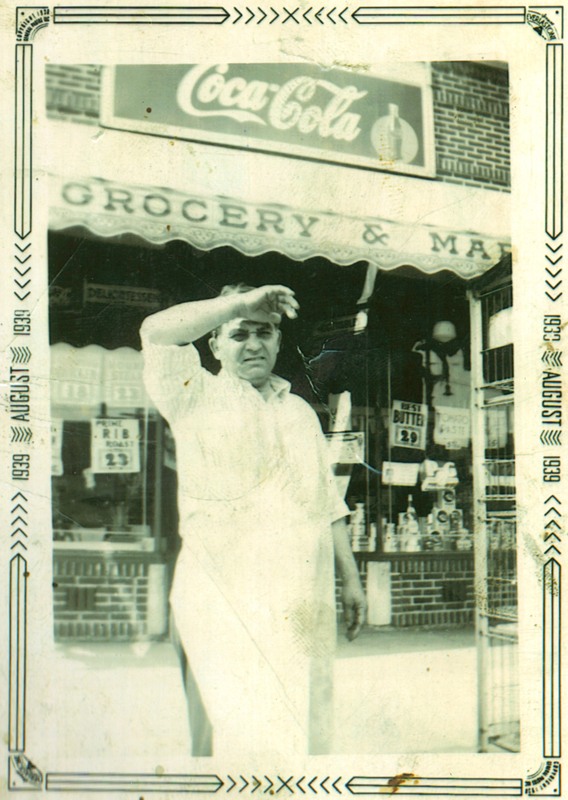 My grandfather Natale “Nick” Colletti owned a grocery store at 2804 West Chicago Avenue from the 1920s until the 1960s. That is definitely his grocery store pictured there – it is the grocery store with the “Quality Market” and “coffee” signs! 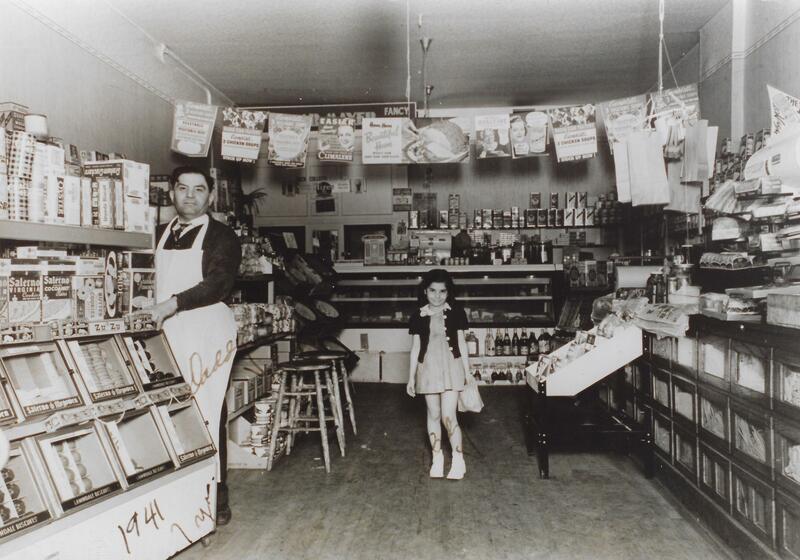 I have included a few pictures of Grandpa Nick in front of and in his store (my mother is with him in the 1941 picture). 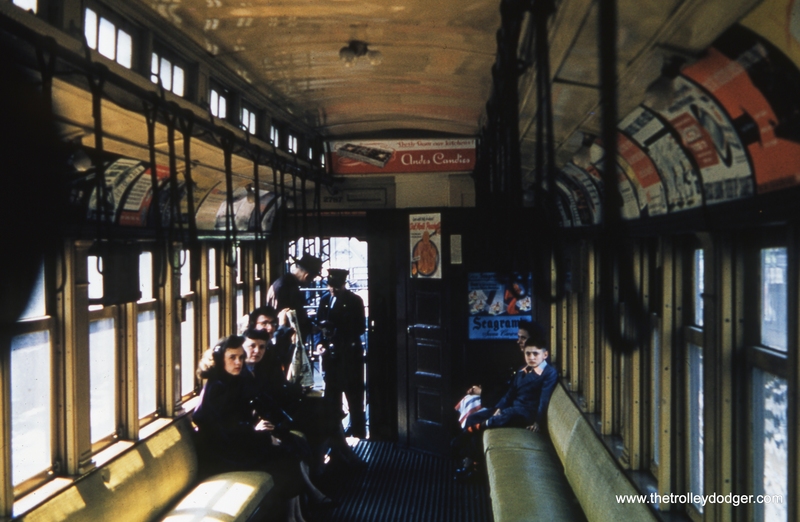 Of special interest for your website is the 1939 picture which has my Grand Uncle David Bullaro (my grandmother’s brother), my grandfather by a customer – and the customer is a trolley driver I believe (you’d know better than I)! 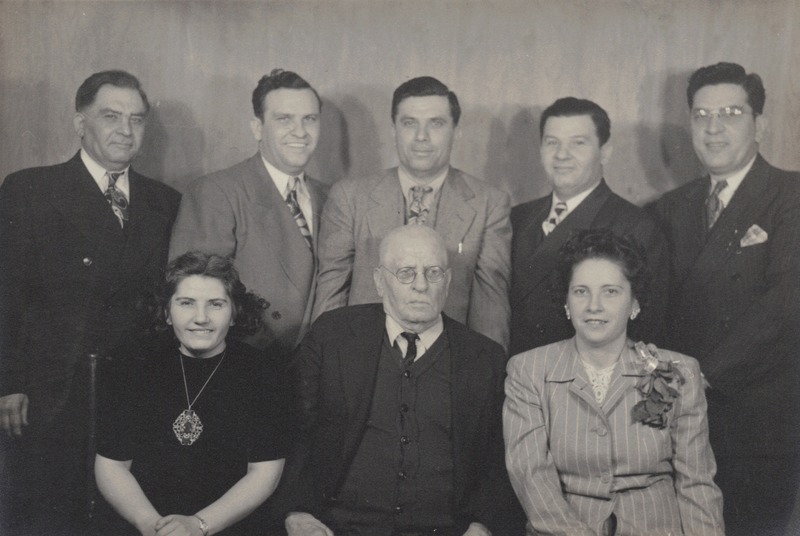 Natale “Nick” Colletti was born one of 9 children to Vito Colletti and Calogera Piazza on January 3, 1896 in Burgio, Italy. He worked in Italy until he was 18 as a farmer. On March 26, 1914, he left for the United States at age 18 on board the SS Canada, the first member of his family ever to come to the U.S. He arrived at Ellis Island on April 8, 1914. He served in the U.S. Army during World War I, and in 1918, petitioned for “fast” naturalization because he was in the military. It was granted and he became a citizen. He served some of his military service at Camp Hancock in Augusta, Georgia where he was made a citizen. After the military, Grandpa Nick moved to Milwaukee where he worked as a blacksmith at a steel mill. He took a trip to Chicago with a cousin and met my grandmother Carmela “Nellie” Bullaro. 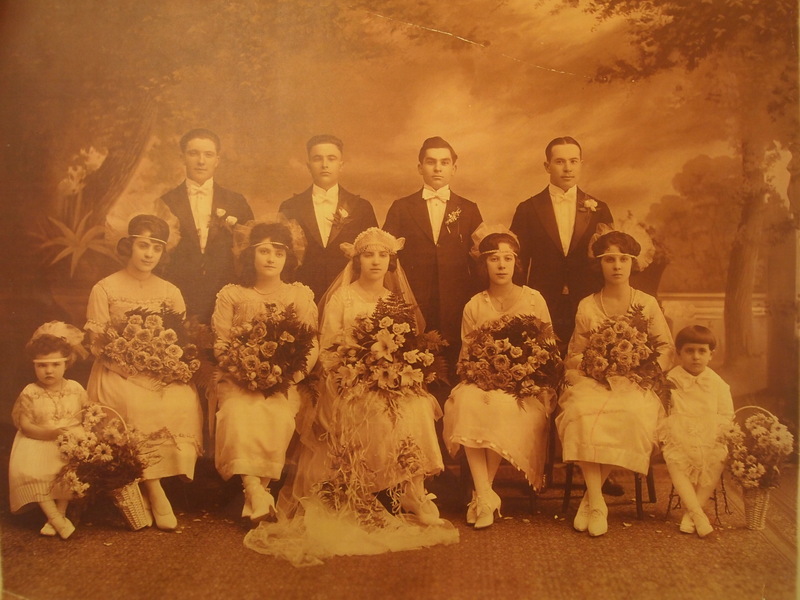 He moved to Chicago and the couple was married at Saint Philip Benizi Church on October 31, 1920. 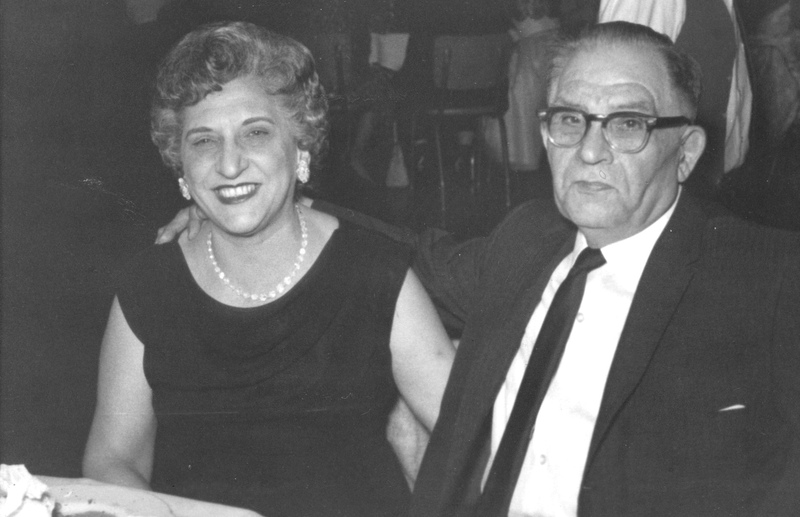 They would be married until his death in 1972, for more than 50 years. They had three daughters – Caroline, Lucille, and my mother Josephine. 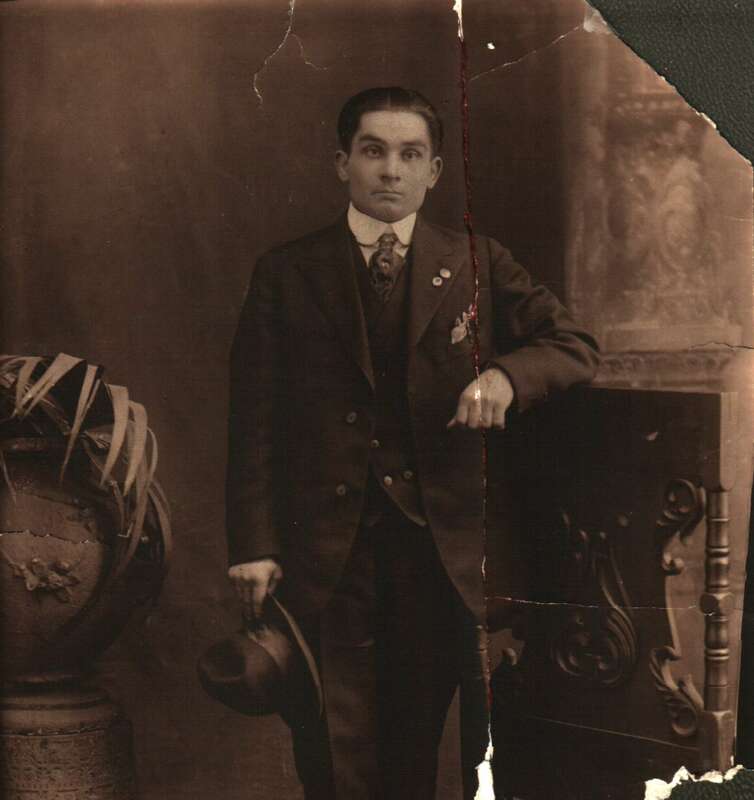 Grandpa Nick worked at various jobs, including as a shoemaker at Florsheim Shoes and as a boilermaker. 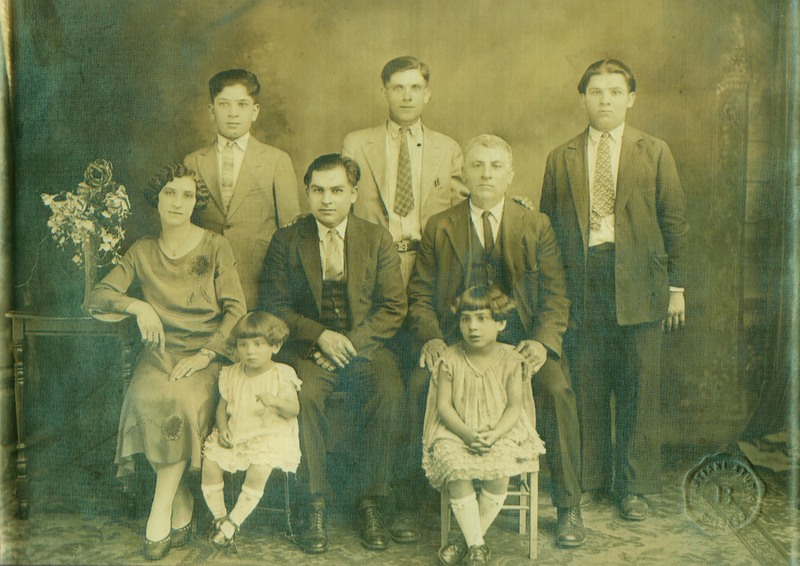 In addition to taking care of his family, he saved money and brought 7 of his 9 siblings and his parents to the United States. 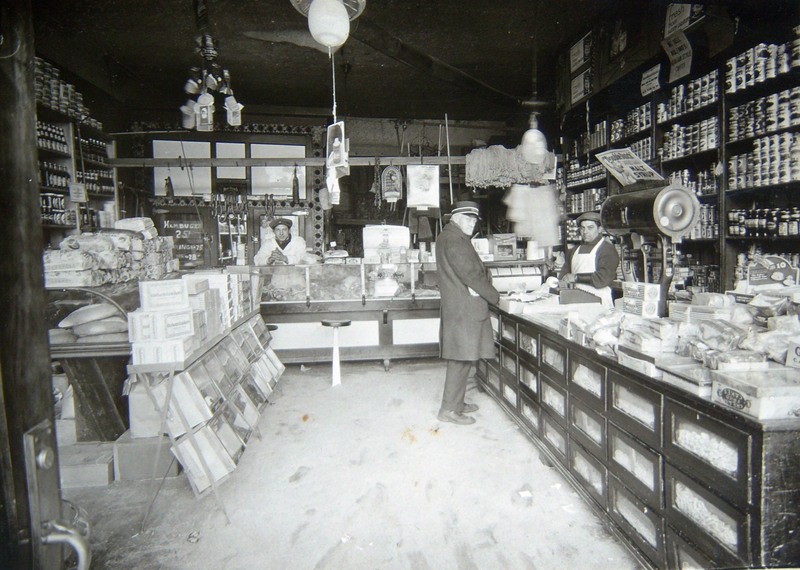 In 1928, he purchased a small neighborhood grocery store at 2804 West Chicago Avenue. He would own and run the store from 1928 until September 26, 1962 when he sold the store for an amazing $450. The grocery store had a variety of food to purchase, despite being a small store. In many ways, the store symbolized the immigrant assimilation experience as it sold very American products like Coca-Cola and Italian specialty items like pasta (at a time when pasta was seen as a strange and exotic item by other Americans!). He loved wind-mill shaped cookies and in pictures you could see that cookies made up some of the prime shelf space at the store! The store had a full meat market and butcher shop, and chickens and sausage were sold fresh at the store. His store had a phone as early as the 1930s, and he had trouble calling home because he could not pronounce the prefix “Independence” properly – it came out as “Indipidance” and the operator did not understand his accent always. 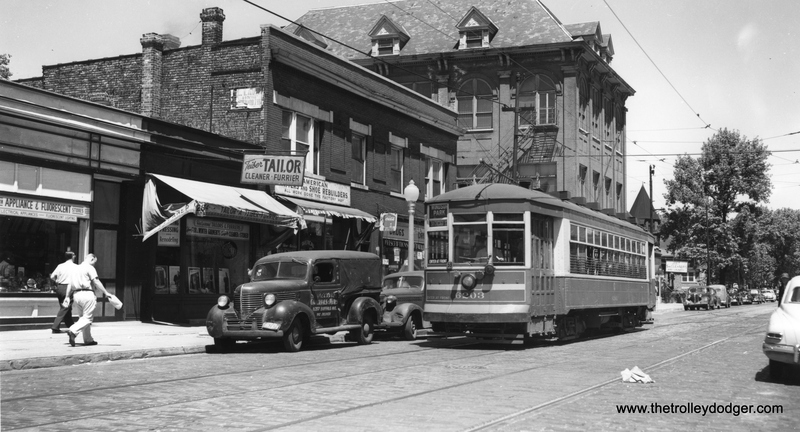 His store served the entire “Patch” neighborhood and surrounding community, including the passengers and crew of the trolleys that went past the store all day. On June 12, 1972, Grandpa Nick went to the bank to run an errand. He suffered a heart attack at the bank and passed away. In 2000, we had his name added to the American Immigrant Wall of Honor at Ellis Island. 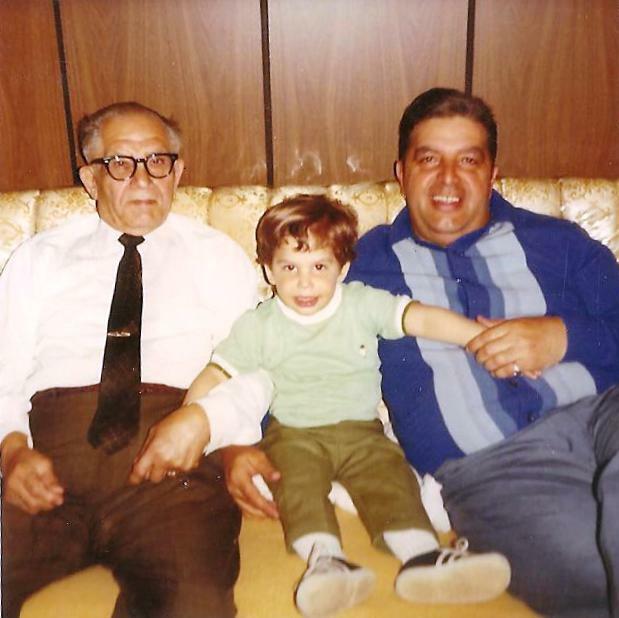 Thanks for a great website, and thanks for sharing my grandfather’s story. 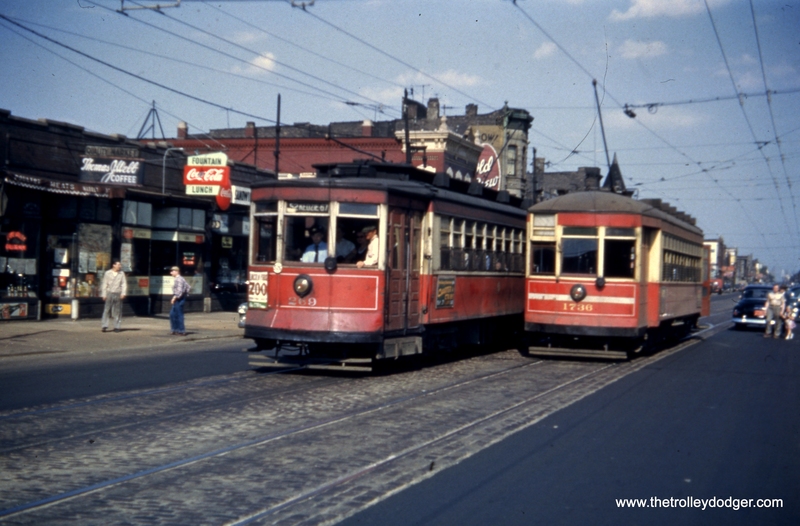 Image #820 shows CTA 2730 at Van Buren and Ashland, on the reroute of the Garfield Park “L” used between 1953 and 1958. 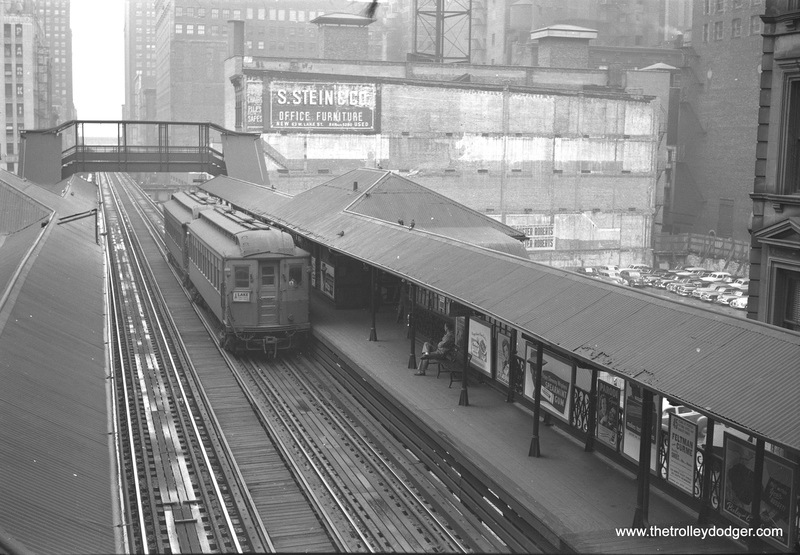 A sign hanging on the front of the car indicates this train connects with a Chicago, Aurora & Elgin train leaving DesPlaines Avenue at 6:12 pm. 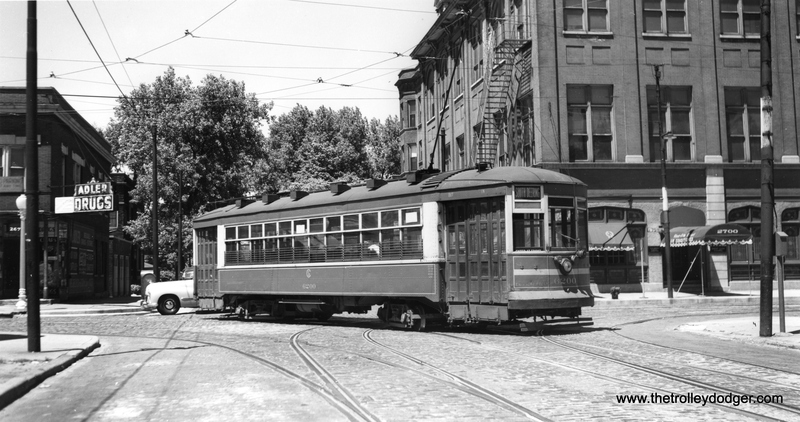 The #9 Ashland streetcar, bussed in early 1954, actually ran on Paulina at this point. This slide is dated August 1955, but you would think expressway construction would have been further along by then. Perhaps the date is wrong and the picture was taken earlier. Based on the many entries we received, our readers had a field day with our Chicago Rapid Transit Mystery Photos contest. Here are all 21 photos from our original post, with locations and other interesting information added to the captions. We thank everyone who participated. There were many good submissions, but probably the best overall entry came from Andre Kristopans. Edward Maurath also provided us with lots of great historical tidbits, even though his entry came in past the contest deadline. He gets an honorable mention. Although one person wrote that identifying the locations was not difficult, no one seems to have gotten all the information 100% correct. The most difficult picture to pin down was #809. 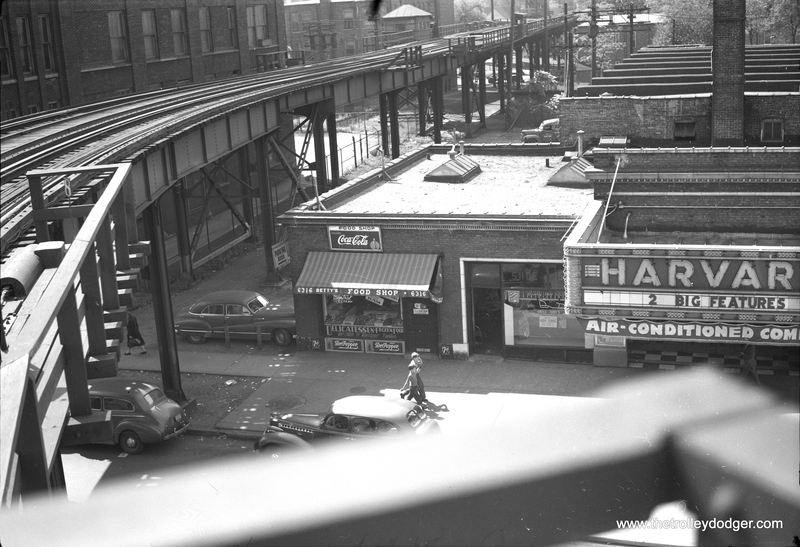 There is only one location on the outer end of the Lake Street “L” where the street takes a jog like the one seen in the picture, and that is at Harlem Avenue. Image #807 also threw some people for a loop, but it is clearly taken at Rockwell, since the “L” train has just descended the ramp from Western. Also, one of the storefronts in the picture houses the Rockwell Upholstering Service. Keep an eye on this site for more “mystery photos” in the future! PS- According to John Bromley, the photos with the fuzz at the top of the frame were probably shot by John Stern. If they were all taken at about the same time, the time frame would be somewhere between late 1949 and early 1951. This can be inferred due to there being A/B skip stop service on Lake and Ravenswood, but not Douglas. 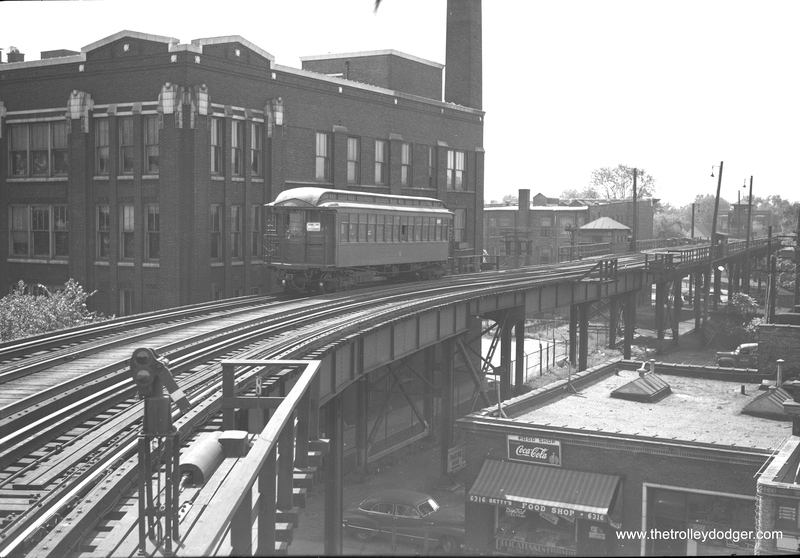 The Normal Park and Kenwood branches are already being operated as shuttles in these pictures, and the wood Logan Square train photo would have to predate the opening of the Dearborn-Milwaukee subway on February 25, 1951. 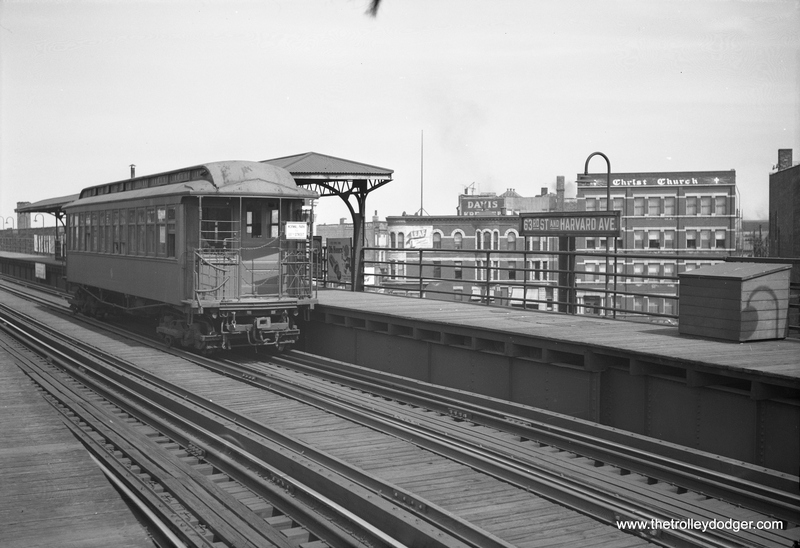 The Douglas Park “L” was cut back to 54th in 1952. Image #817 shows a Normal Park shuttle train on the inbound track at 63rd and Harvard, ready to proceed south. 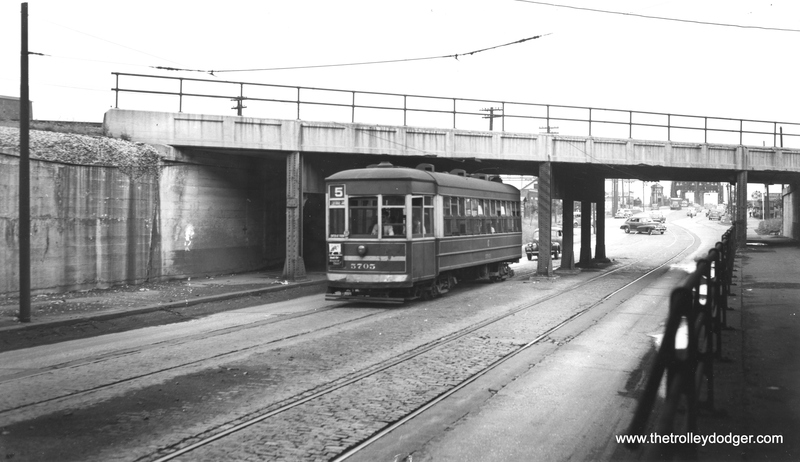 As Robert Leffingwell notes, “The Normal Park branch was so close to Harvard Ave. that it didn’t have to cross over to the southbound track.” This picture was probably taken circa 1949. 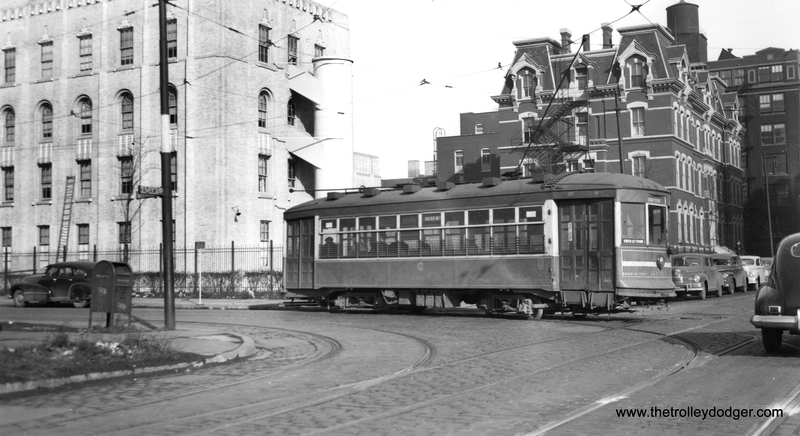 Edward Maurath says, “Nearer car (in Image #815) is 392, originally made for the South Side Line in 1905 by American Car and Foundry.” The location is Kimball and Lawrence, terminal of the Ravenswood “L” (today’s Brown Line). This photo was taken circa 1949. Litter was apparently a problem then too. Image #813 is looking west at Marshfield Met Main with a westbound CA&E train at the auxiliary platform. 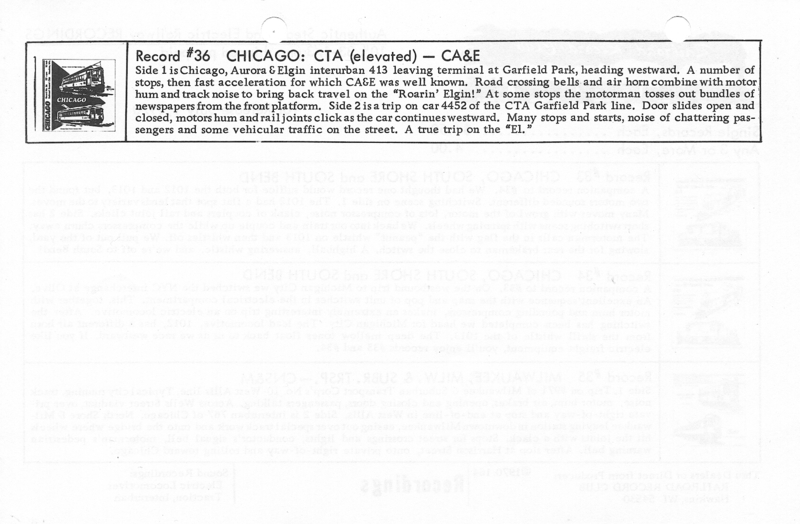 Edward Maurath notes, “Wooden cars acquired by the Chicago, Aurora and Elgin second hand from the North Shore Line at Marshfield Jct, a very busy place. 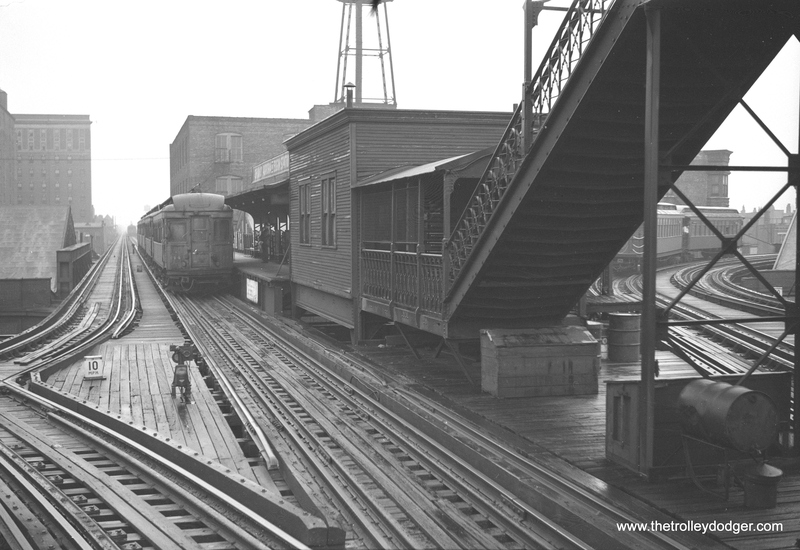 …Tracks curving to the north went to the Logan Square and Humboldt Park branches, while tracks curving to the south went to the Douglas Park branch. 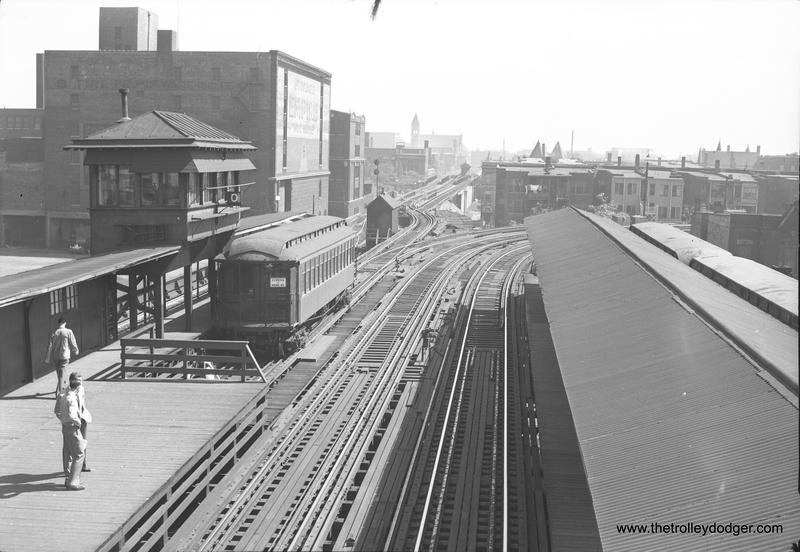 When these tracks were removed in 1953 to make room for the Eisenhower Expressway, the north and south tracks were connected to form what was later called ‘the Paulina Connector.’ ” An inbound Logan Square “L” train is visible at right. 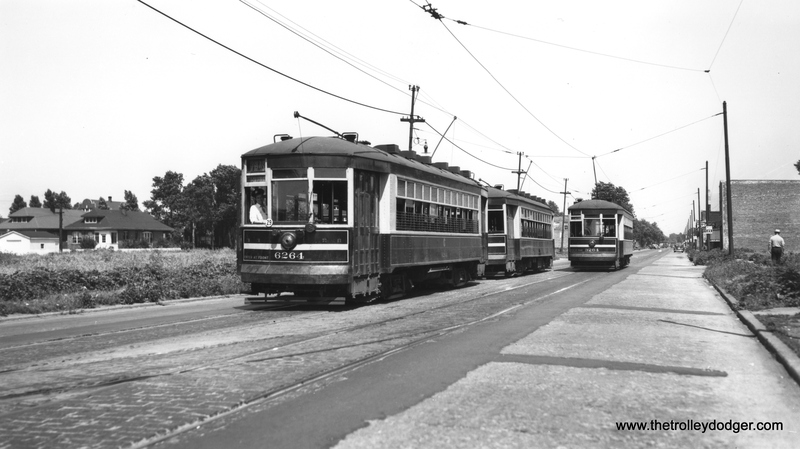 Andre Kristopans says that Image #812 shows a “Kenwood shuttle EB leaving Lake Park/Ellis approaching 42nd Pl terminal.” The date is circa 1949. 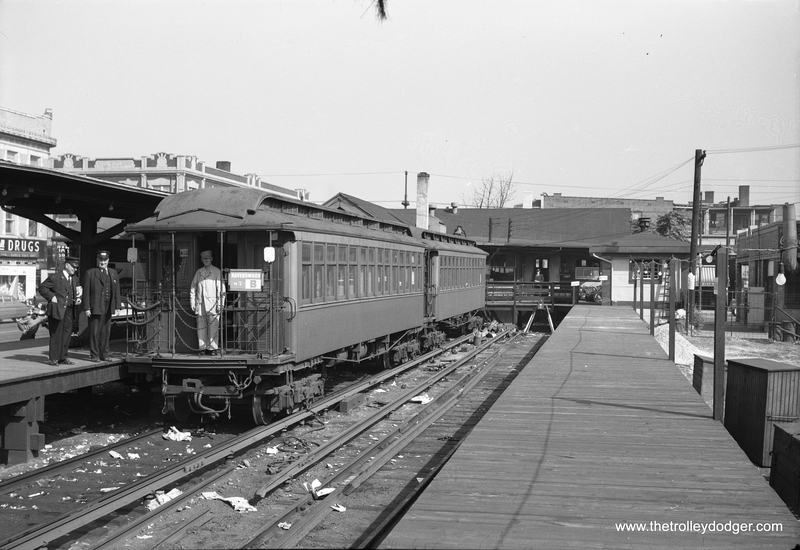 Image #810 shows, as Andre Kristopans notes, a “Kenwood shuttle at (the) Indiana pocket.” Edward Maurath adds, “By this time the Kenwood Line had been demoted to a shuttle. Notice the remains of where the Kenwood Line used to have a double track connection to the main line. The car would appear to date back to the 19th century. View is looking east.” The time is circa 1949. Image #809 is one that I don’t think anyone guessed correctly. It’s obvious that this is the outer portion of the Lake Street “L” where it ran on the ground. But the street takes a jog just behind the “L” car, and the only place this could be is Harlem Avenue. On the west side of Harlem, it’s Forest Park. This appears to be the back entrance to the Marion Street station. 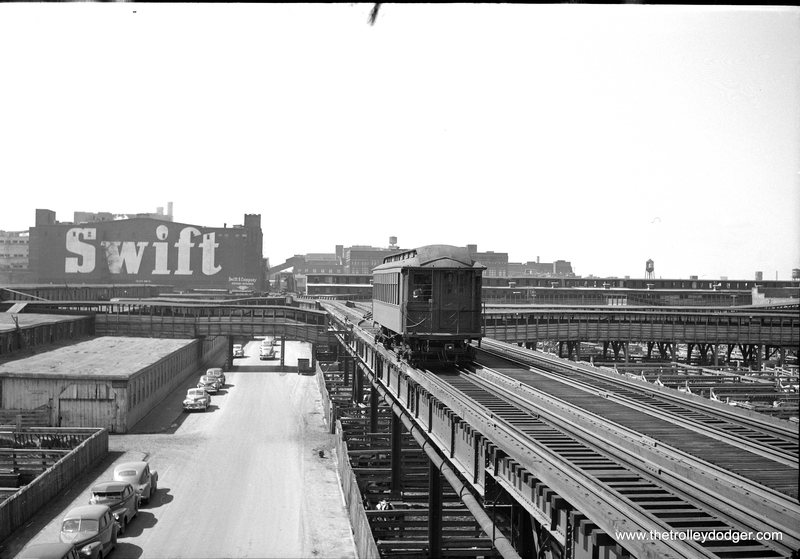 The “L” was relocated onto the C&NW embankment in 1962. This picture was probably taken around 1949. 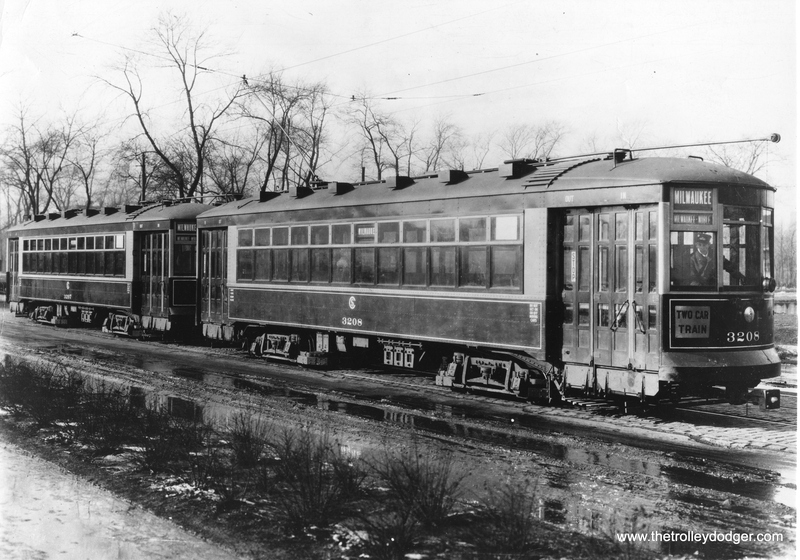 Edward Morath says Image #808 shows “Nearer car 2100 built by Pullman in 1894. 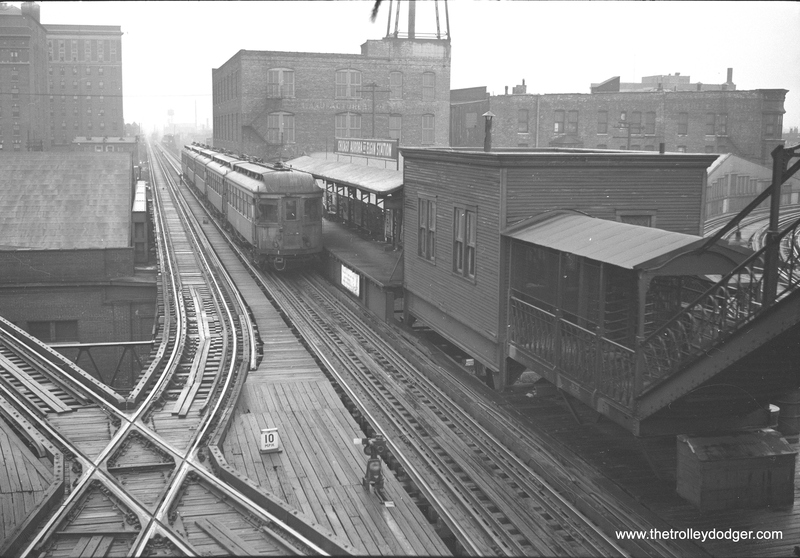 Train is leaving Damen station headed northwest.” This is presumably a Logan Square train on what is now today’s CTA Blue Line. The photo was probably taken circa 1949. 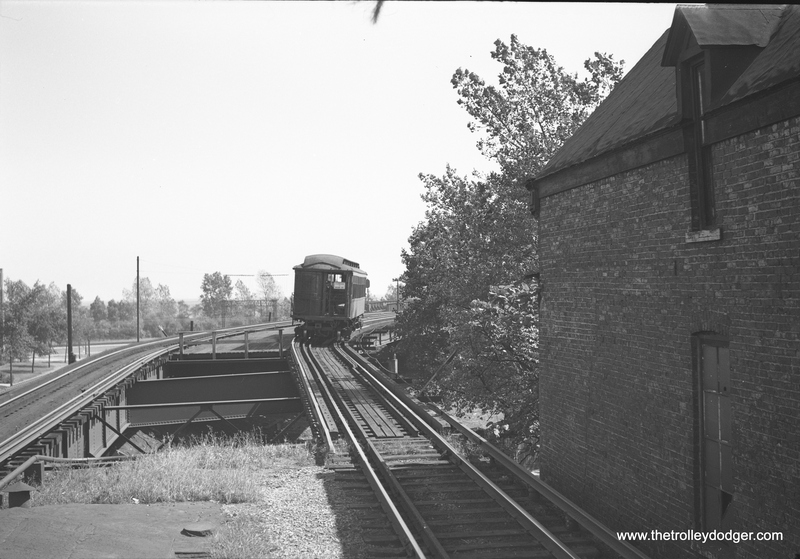 Image #807 shows an outbound Ravenswood train at Rockwell, circa 1949. The train has just descended a ramp from the Western station. 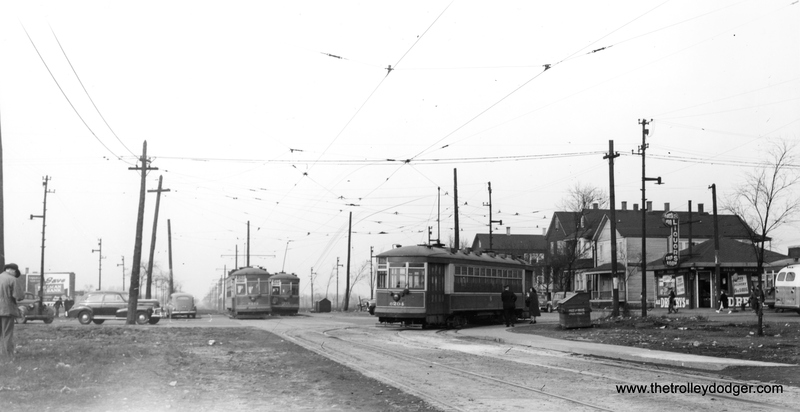 Andre Kristopans says that Image #806 is “looking east from Exchange on the Stock Yards branch.” The time is circa 1949. 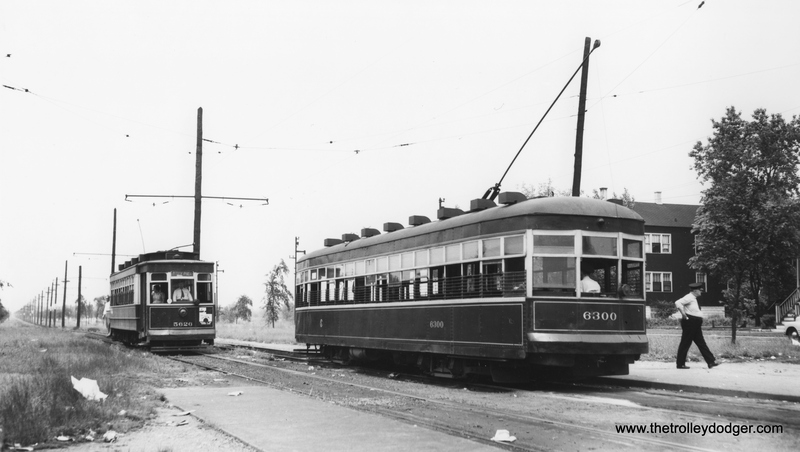 Edwatd Maurath says that Image #805 shows a “Very old South Side gate car headed east towards Exchange Station, looking west towards same bridge as in #806. 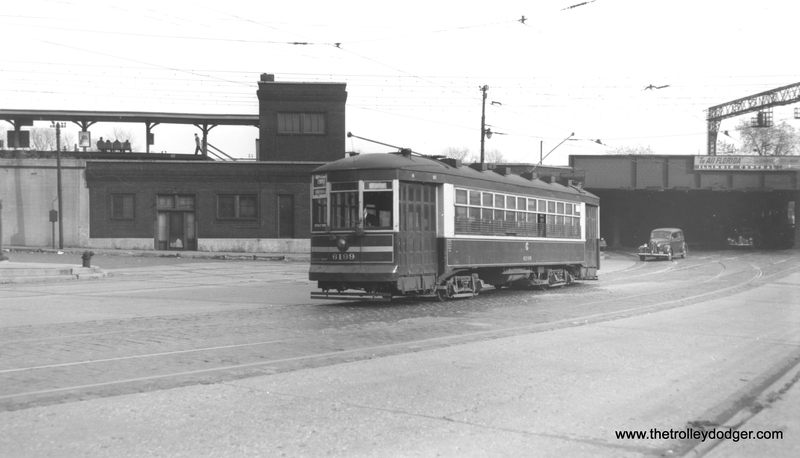 From the shadows, it appears to be around noon.” We are on the Stockyards branch circa 1949. 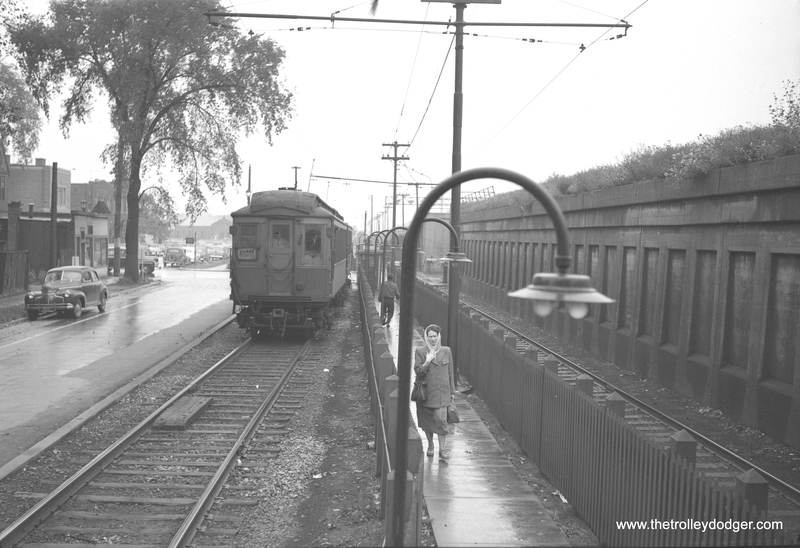 Image #803 shows a very old Met car heading into the Oak Park Avenue station on the Douglas “L” circa 1949. 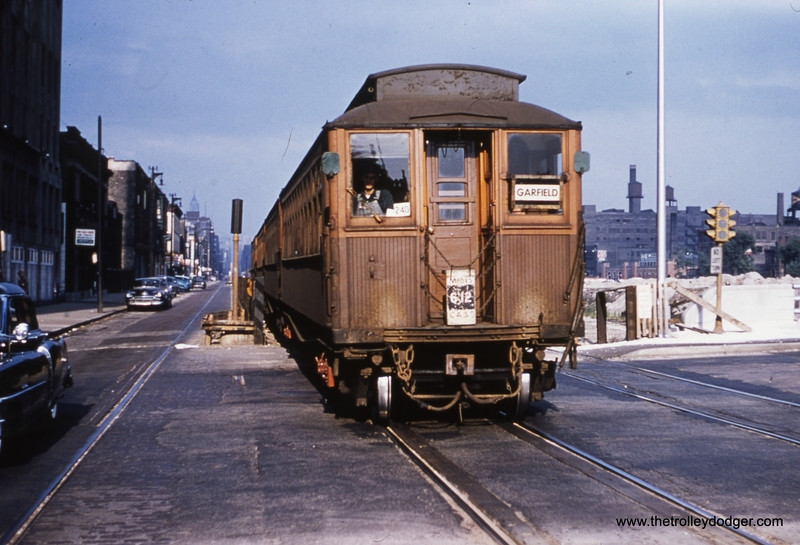 Douglas Park trains did not get A/B “skip stop” service until 1951. 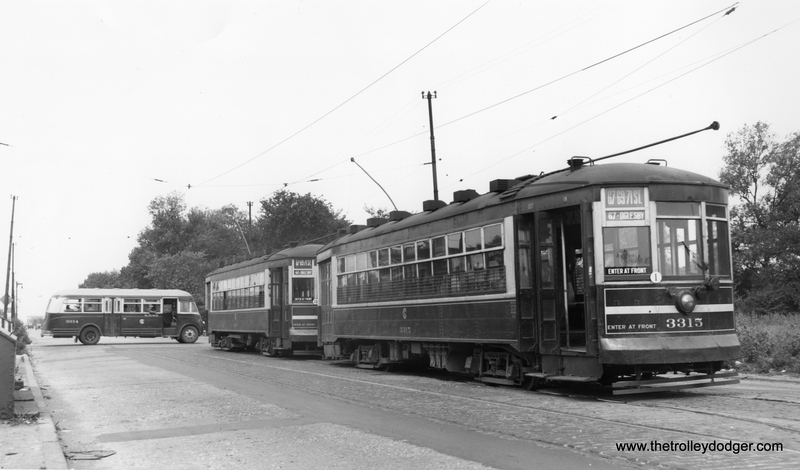 In 1952, the line was cut back to 54th Avenue and service west of there was provided by an “interurban” bus. 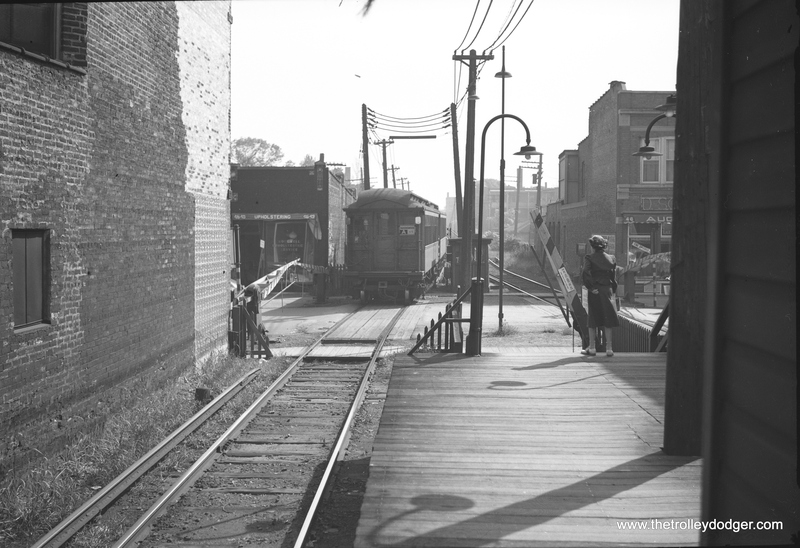 [caption id="attachment_1016" align="alignnone" width="665"] Image #801 shows the Kimball Yard on the Ravenswood “L”, today’s Brown Line, looking northwest. It’s hard to imagine it looking like this, considering how tight space is in this yard today. 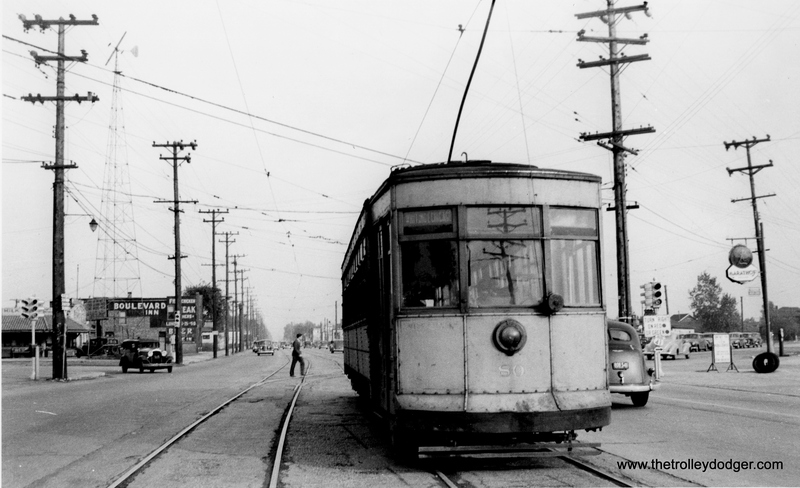 A southbound Kimball bus (a Brill 2000-series) is at left, and the date is circa 1949. Check out the duck pond. 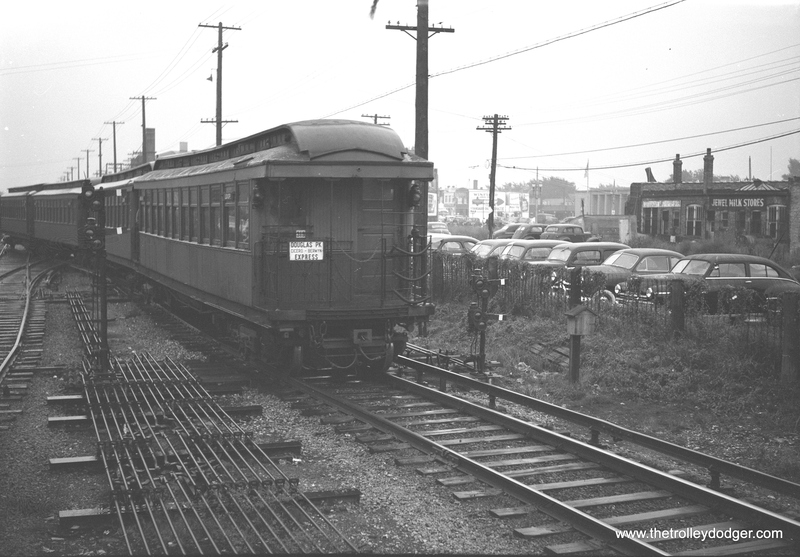 Image #800 shows the same area as Image #813, a CA&E train of wood cars at the Marshfield auxiliary platform circa 1949. 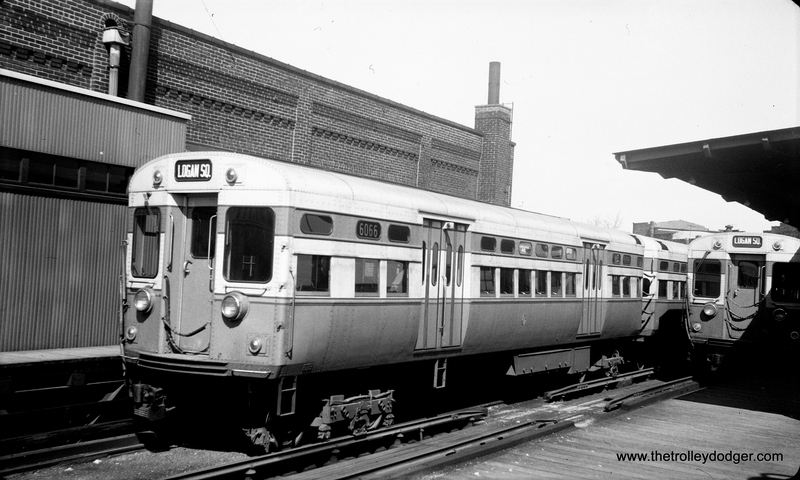 (The Great Third Rail, CERA B-105, says on page II-7 that “CA&E maintained its own westbound loading platform just west of Marshfield junction on the Garfield ‘L’ line.”) These cars were ex-North Shore Line and were purchased by CA&E in 1946, ironically the last passenger cars bought by the railroad. The Douglas branch curves off to the left. Today, the Eisenhower Expressway runs through this spot. 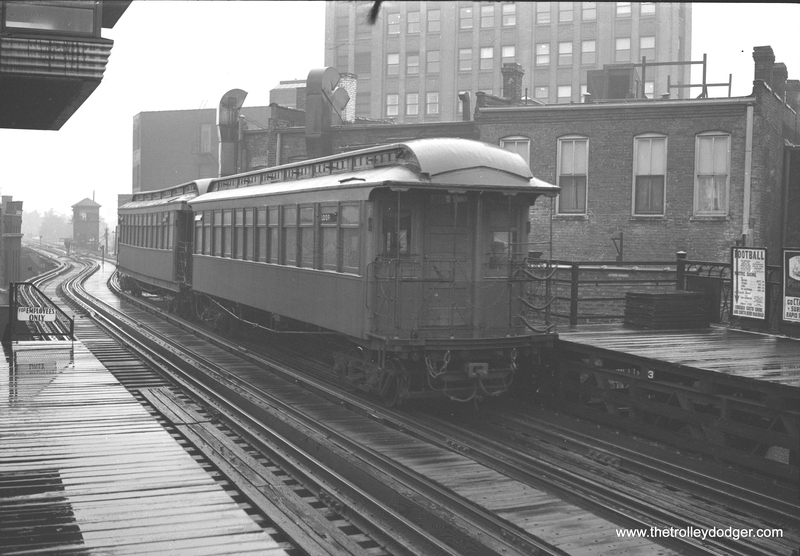 There is probably no way anyone could guess it, but this picture in CTA car 2787 was taken on the last day of Humboldt Park “L” service, May 3, 1952. 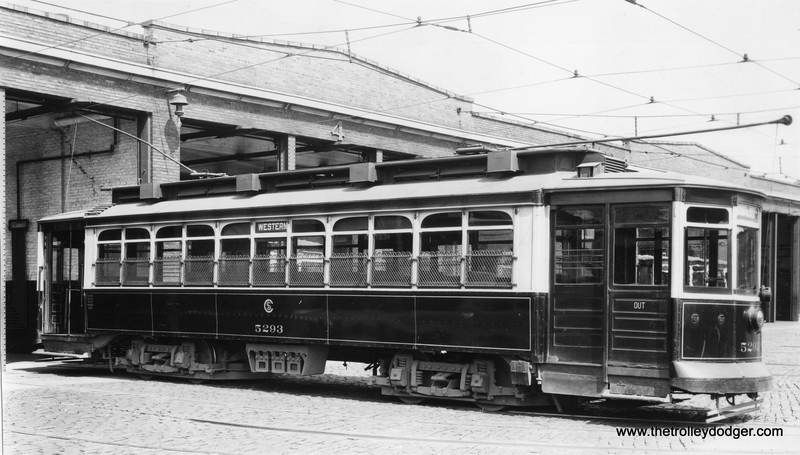 The Trolley Dodger has reached a milestone, with 20,000 page views in our first 90 days. 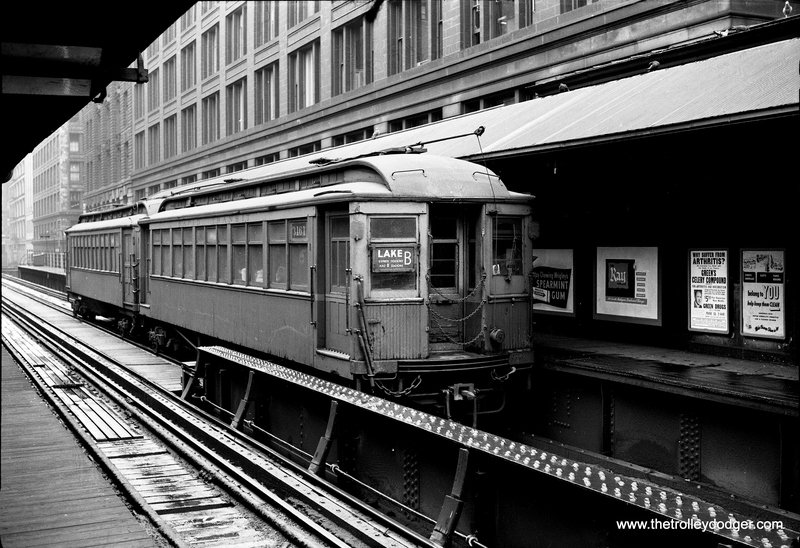 To help celebrate that, we present 20 mystery photos, showing some very rare Chicago Rapid Transit scenes. Over the next four days, we invite our readers to tell us some interesting things about these photos– where they were taken, what they show, and whatever tidbits of information you have to share. The contest ends at midnight Central Time on April 25, 2015. Send your answers to thetrolleydodger@gmail.com and we will update the captions with the best submissions once the contest has ended. The photo at top is not part of the contest. When referring to individual photos, please use the image numbers provided in the captions. As always, clicking on each image will bring up a larger view in your browser. We thank you in advance for your participating. Have fun figuring all this out. PS- I’ll give you a clue. Chances are the pictures that have a piece of fuzz at the top of the frame were most likely taken around the same time, by the same unknown photographer. #800 – Garfield L – view west toward Pulaski? #802 – Jackson L – 63rd & S. Harvard Ave, view southwest toward 63rd St. No buildings shown here remain standing. #804 – Loop, Wabash & Randolph, view south. #805 – Stock Yards line and Swift slaughterhouse, birthplace of the “disassembly line” and inspiration to Henry Ford to invent the automobile assembly line. 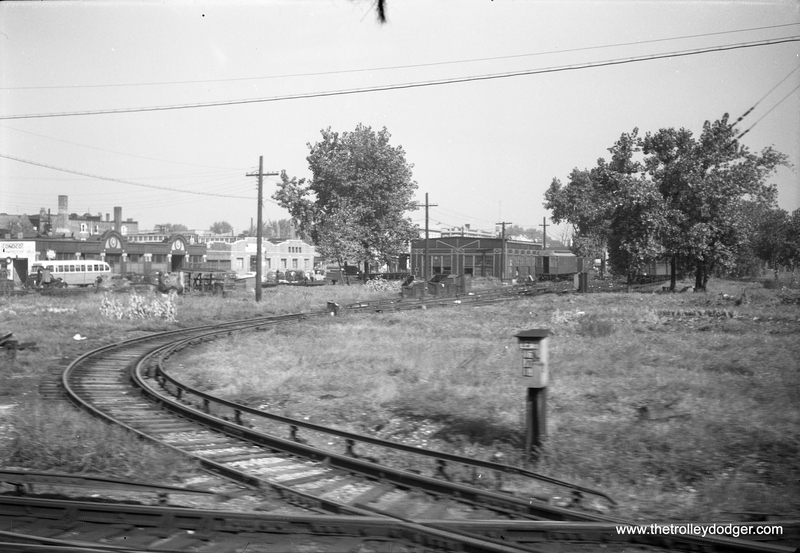 #807 – Ravenswood L – view east at N. Rockwell. A faded trackside sign on the upholstering shop in this photo reads “Canton Hand Laundry.” Remarkably, this sign remains visible today, 70 years after this vintage shot was taken, demonstrating the durability of lead paint and linseed oil. 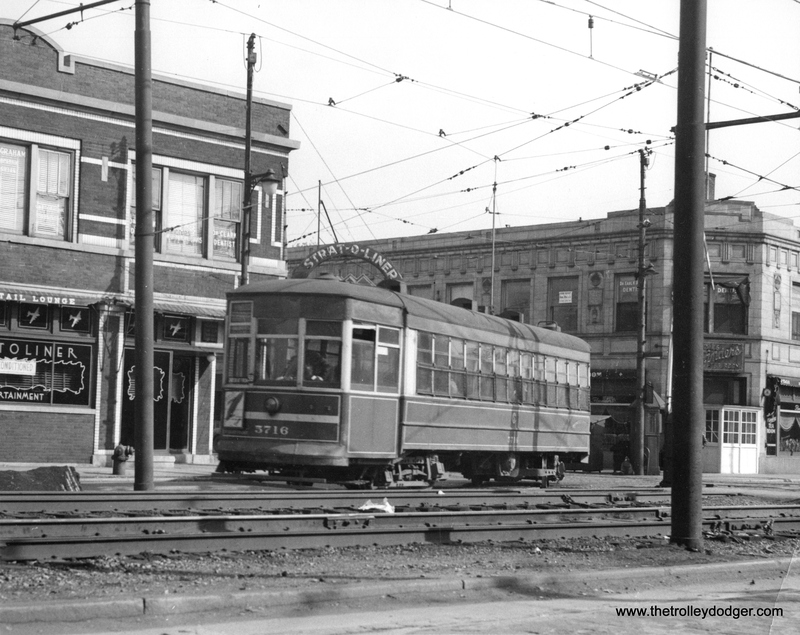 #808 – Humboldt L – view northwest at Damen & Milwaukee. Riding this line could mean a nice afternoon in the park and visit to the soda fountain at Mid-City? Dairy on North Avenue, or, more likely, a visit to Dr. Orloff, the family dentist on North & California, across from Walgreens and the Crystal Theater. #809 – Lake St. L – Oak Park. #810 – Jackson L, south at 62nd St.
#811 – 63rd & Harvard, southwest. #812 – 63rd, near Harvard, northeast. #813 – Garfield L, west. #814 – Lake near Wells, looking east. 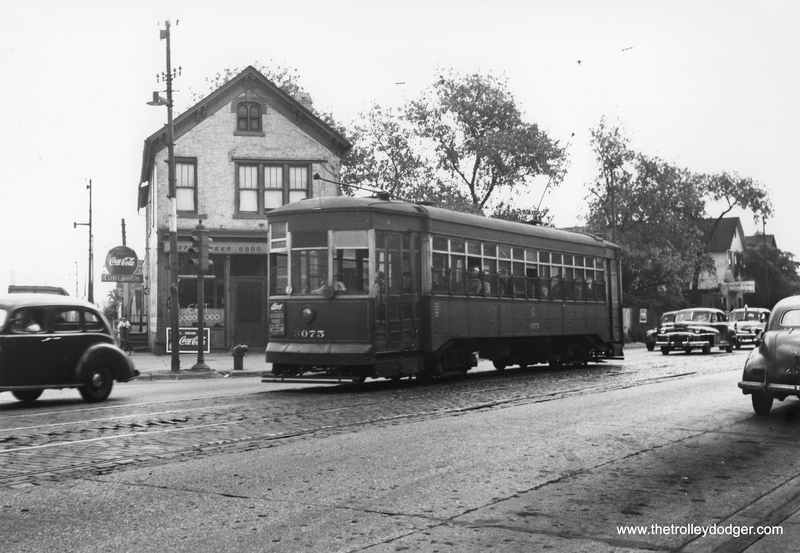 #815 – Ravenswood L terminus, Lawrence & Kimball. #816 – Loop, Wabash, next to Field’s. #817 – 63rd & S. Harvard. 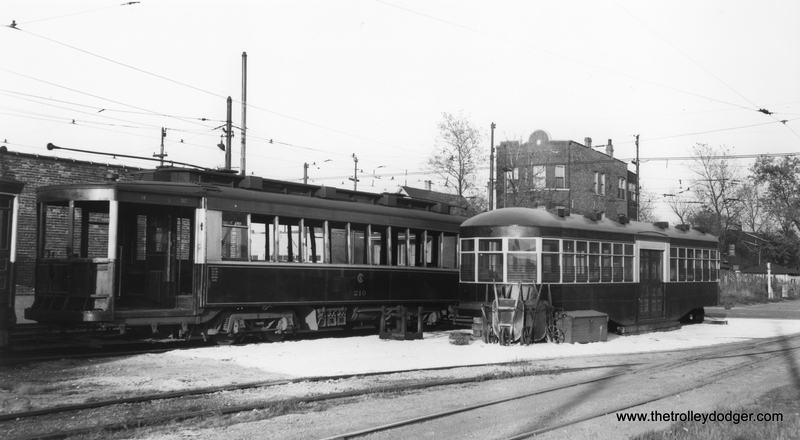 #818 – Logan Square terminal in 1950, with new cars to test in the final months of the Milwaukee-Van Buren run along Paulina. 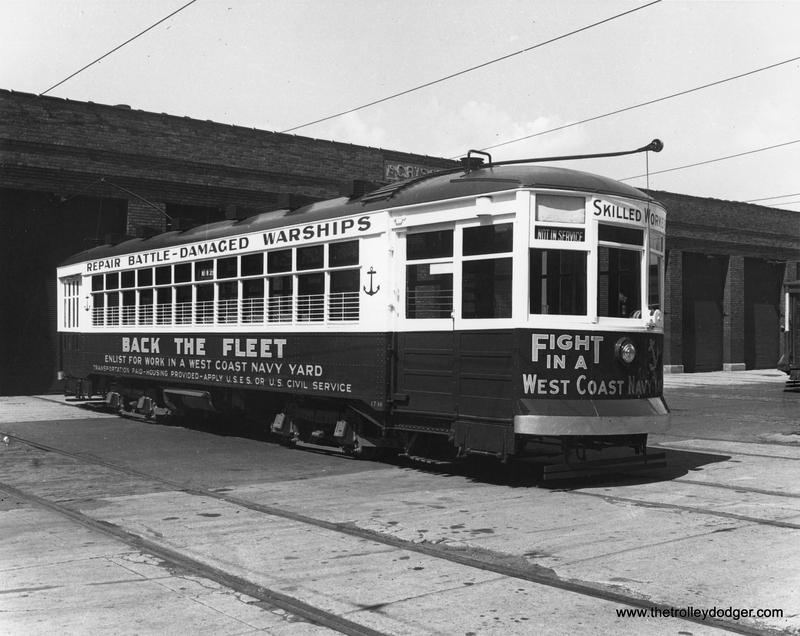 #820 – Garfield L running at grade on Van Buren, view east, maybe near Western. 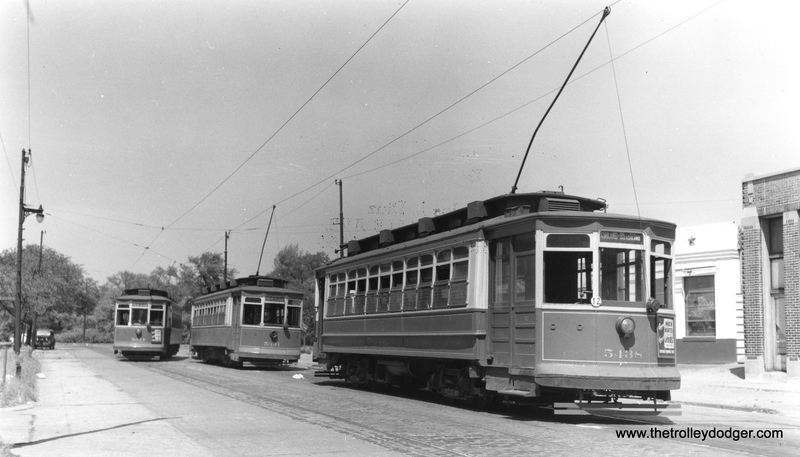 Probably late 1953, just after the L structure was closed. Anyway, thanks again for your great site. Keep up the good work. probably the same date) as 817. Kimball, at the end of the Ravenswood. I’d be very interested to know where some of the others are. 800 — Marshfield Ave looking west. That’s a W/B CA&E train of North Shore woods. This is before clearing for the expressway started. 801 — Kimball Yard looking north. (The bus is working a S/B trip on Rt # 82 — Kimball-Homan). 802 — Englewood ‘L’ looking west from Harvard station. 803 — Douglas Pk ‘L’ looking east from Oak Park Ave.
804 — Randolph/Wabash looking south. 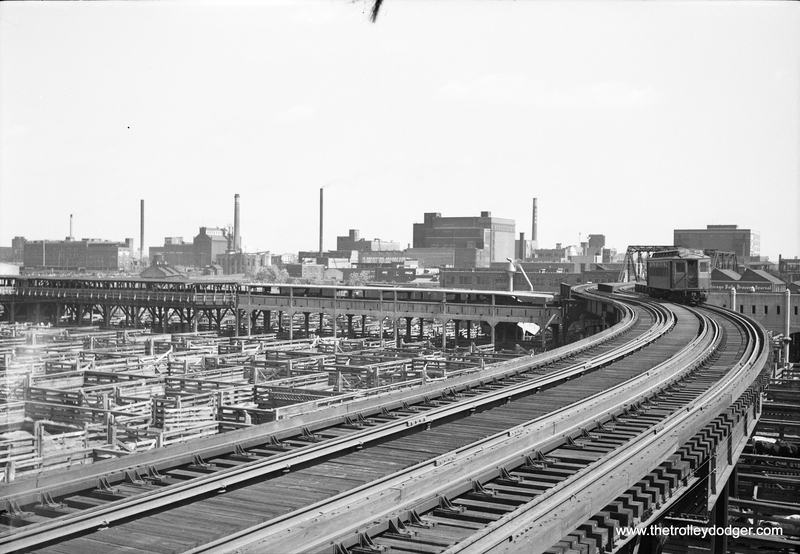 806 — Stock Yards (looking east from Halsted?). 807 — Ravenswood looking east from Kedzie Station. 808 — North/Dament looking north off S/B platform. 809 — Lake St (somewhere betw Central Ave and Oak Pk Ave). 810 — Indiana Ave — that is a Kenwood shuttle sitting in the pocket. View looks east. 811 — Same as image #802 (but with a N/B Normal Pk trn approaching). 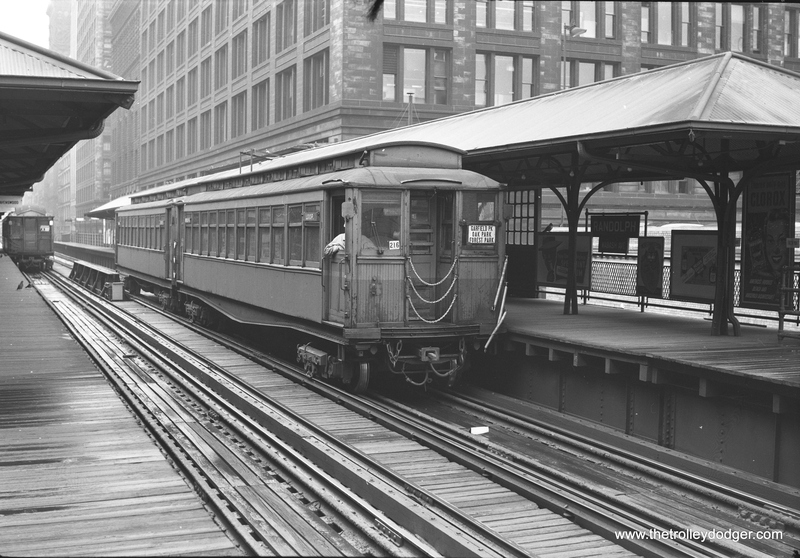 812 — Kenwood ‘L’ — a S/B train is heading off to 42nd Pl terminal. 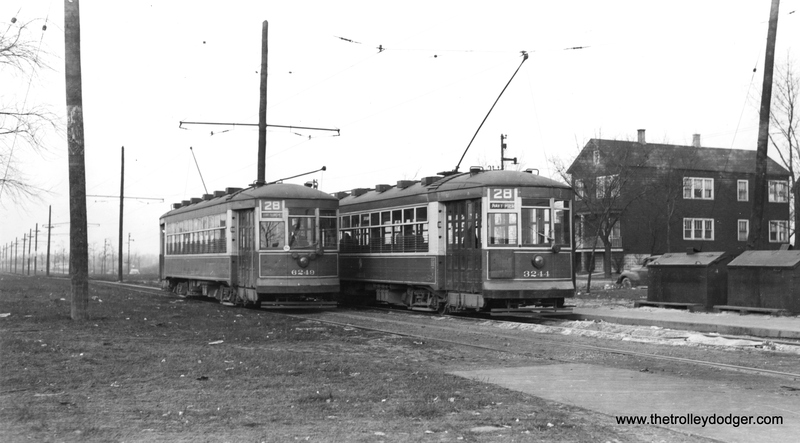 813 — Same as Image 800, but with a S/B Logan Square (or Humbolt Pk) train at right. 814 — Adams/Wabash looking south. 816 — Somewhere on the Loop (not sure of location). 817 — 63rd/Harvard on Englewood. Is that a N/B Normal Pk train in the station? 818 — Logan Square terminal. 820 — W/B Garfield Pk train (which will connect with CA&E’s 6:12 out of Des Plaines Ave). This, of course on the Van Buren St trackage. Location uncertian. Ok, how good/bad did I do? #800 looking west at the CA&E platform at Marshfield with ex NS equipment. #803 Oak Park ave on the Douglas branch. #807 on the Rave I think Rockwell. #808 Damen on the Logan Square. 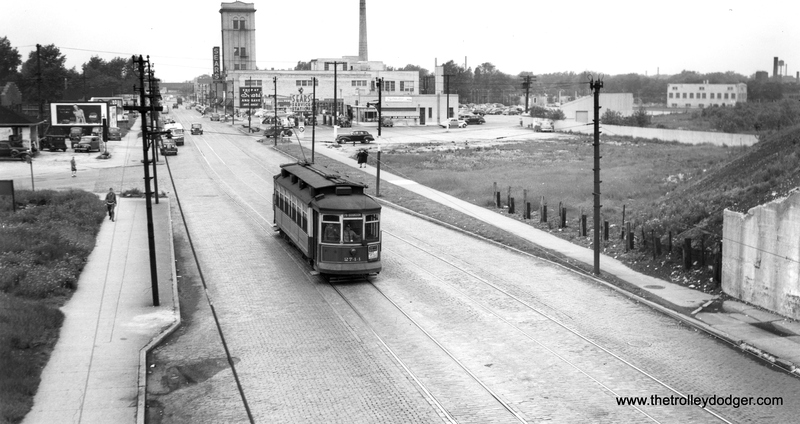 #809 reasonably sure that’s the west end of the Austin station on the Lake St.
#810 looking east @ Indiana Ave.
#814 Clark/Lake on the loop. #816 few clues here unless you know your buildings, guess on the Wabash side of the loop. #817 Harvard on the Englewood. #819 on Van Buren surface tracks. At Ashland? Certainly not west of there! 807- Francisco station on the Ravenswood. 815 Kimball station (Kimball and Lawrence), end of the line on the Ravenswood. 818 Logan Square end of the line, Milwaukee Av and Kedzie.c. 1951. 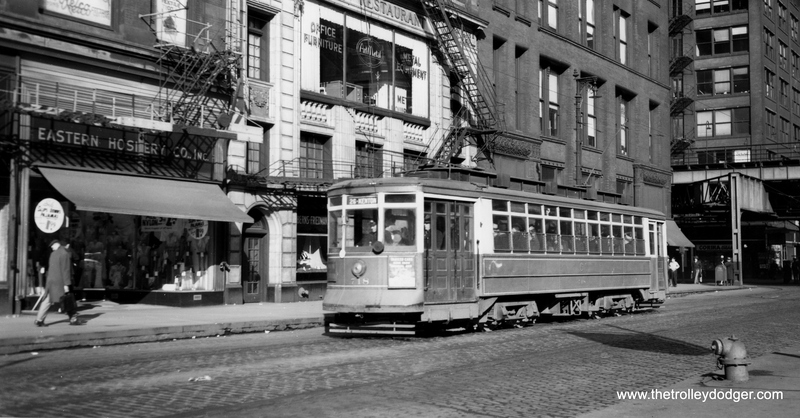 820 harrison and Ashland on the garfield, c. 1954. 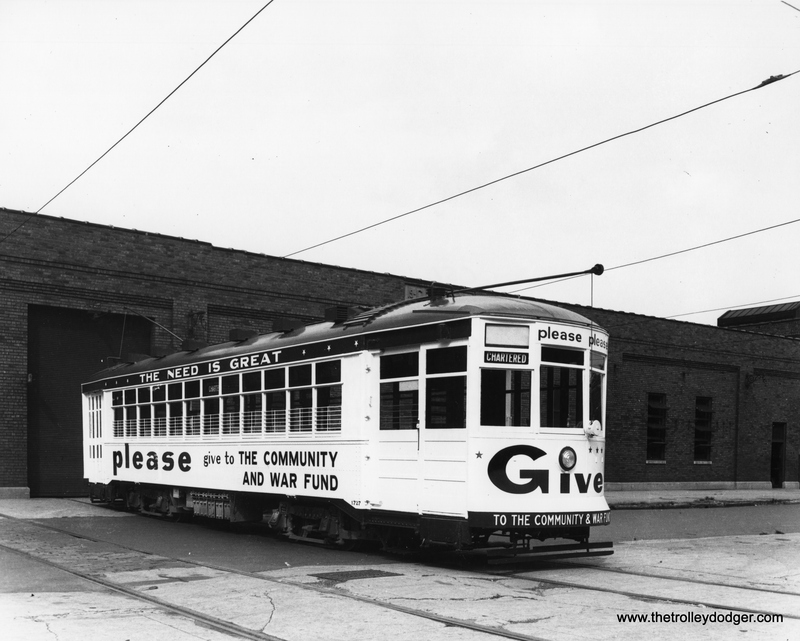 The Trolley Dodger blog started exactly three months ago today, so I thought it would be a good idea to take stock of what we have accomplished. When we hung up our shingle, so to speak, we really had no firm idea what might happen. 90 days in the workplace is generally considered a probationary period. If you can do the job for that long, or so the thinking goes, maybe you have earned the right to keep your job on a more permanent basis. 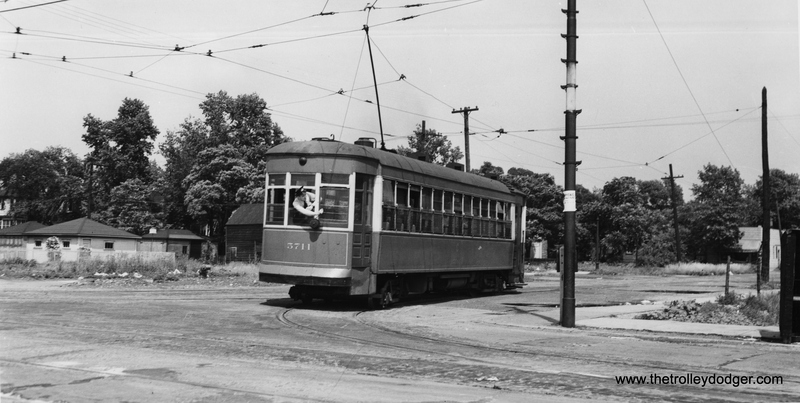 In our first 90 days, we have made 26 posts on a variety of different transit-related topics. To date, we have received 20,000 page views for those posts, which include hundreds of photographs and several videos. We have made our fair share of mistakes in life, but to get that kind of response, we must be doing something right. But what’s most gratifying to me is how much participation we are getting from our readers. So far, there are 187 comments on those 26 posts. A blog is more like a magazine, with short articles that encourage readers to express their opinions. We like the idea of using pictures to tell stories, and we now have many devoted readers who want to take part in that conversation. I would like to think I learn as much from our readers as they are likely to learn from me. It is a collaborative effort, and I believe this blog is ultimately only as good as the people who read it. Little by little, with each new post, we are creating a body of reference work, with original research that more and more people can find in the future. We have now also started an online store, where our readers can help support this blog and our research efforts by purchasing the products we sell. You can also make a donation. We will continue to update and expand the range of our offerings, in the hope that this venture can become a self-sustaining enterprise. If you have not already done so, we encourage you to check it out. We have many exciting things planned for the future. Time is a precious commodity. Thanks for sharing some of it with us. It helps bring us all together, and by enlarging our horizons, makes the world a smaller place. All in all, I’d say that The Trolley Dodger has turned the corner and is off to a good start. We will do our best to keep it going. 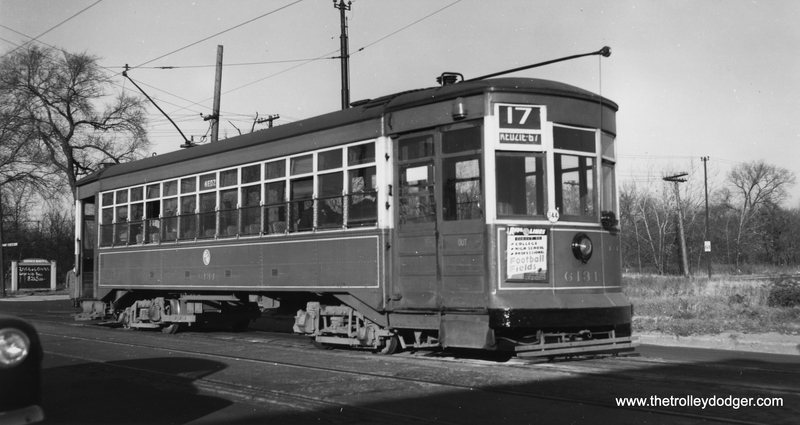 CSL 5716 at Exchange and 75th on October 15, 1945. (Tom Desnoyers Photo) You may recognize the Stratoliner Lounge from one of our earlier posts, which included a link to a color postcard view of the interior. 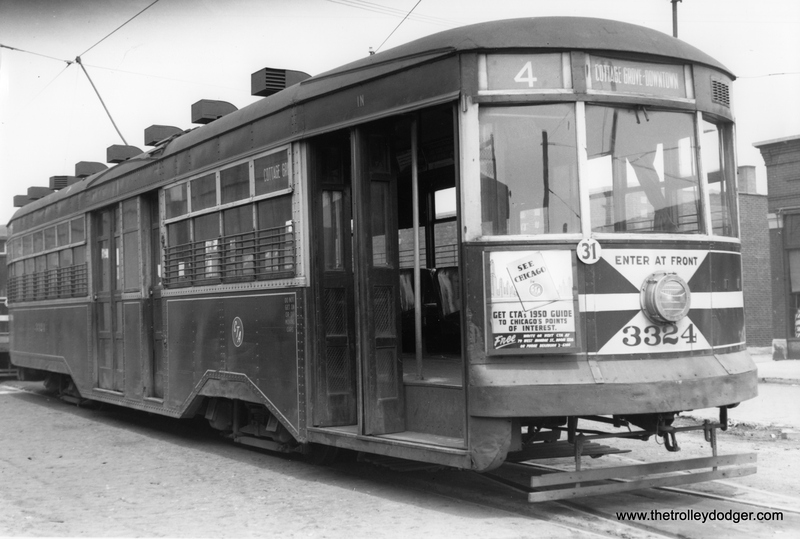 This is the fifth installment in our ongoing series Chicago Streetcars in Black-and-White. 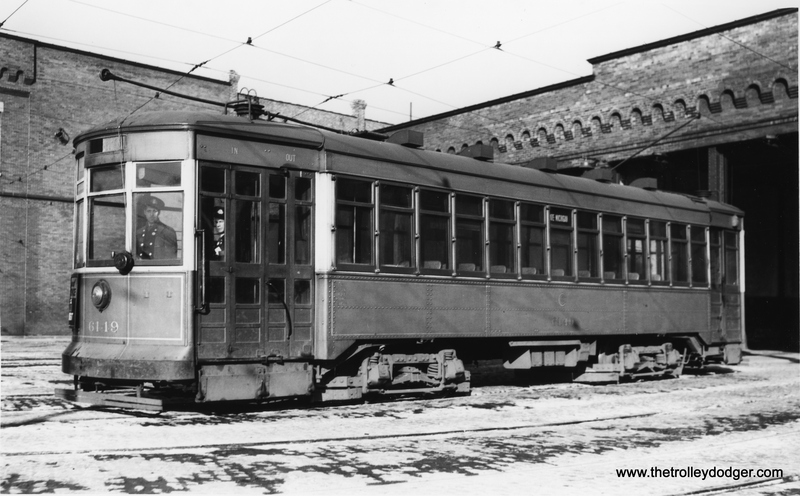 You can find the other four installments (and the others we have done in color) by typing “Chicago streetcars” in the search window for this blog. I am continually amazed at how expert our readers are at identifying mystery locations. 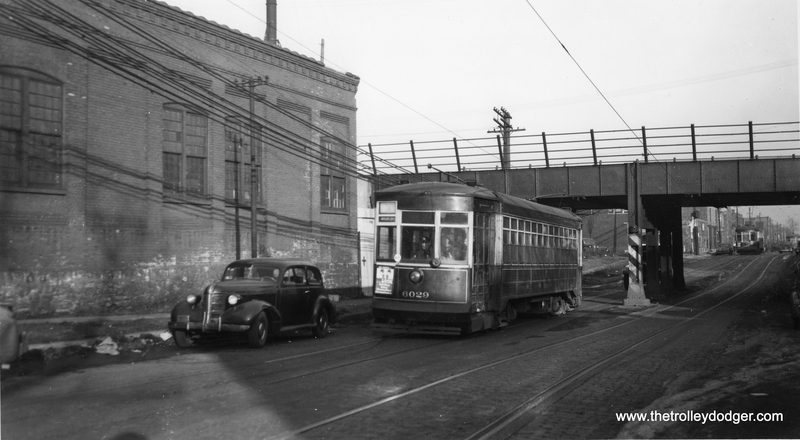 CSL 3207-3208 on Milwaukee Avenue circa 1925-29. CSL 3315 on 71st looking west to California. 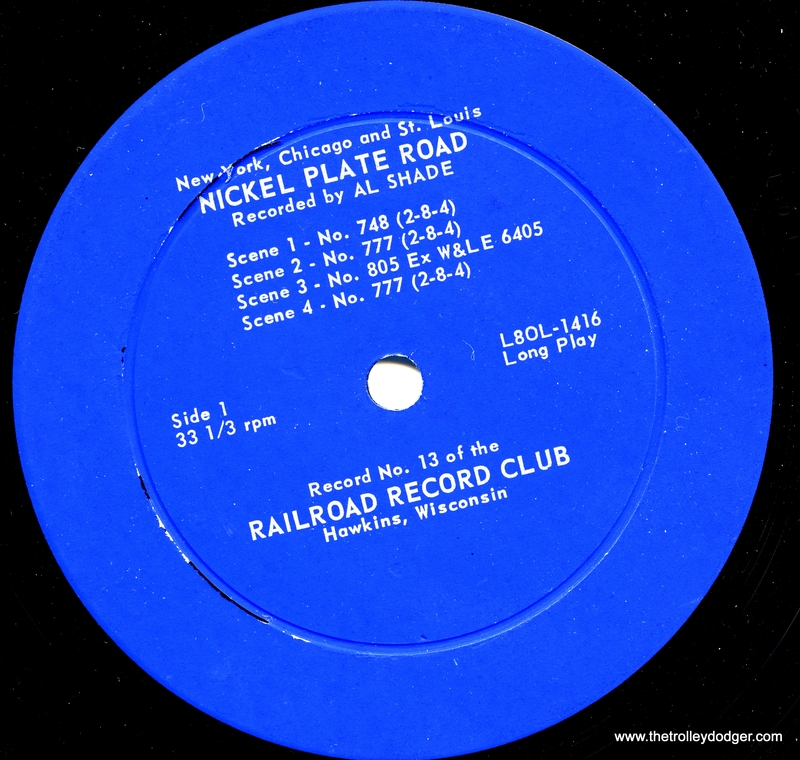 The Railroad Record Club was started in the early 1950s by William Steventon (1921-1993), a farmer living near Hawkins, Wisconsin. He issued a total of 37 10″ records (each containing about 30 minutes of audio) in his original series between about 1955 and 1965. In most years, four titles were issued. 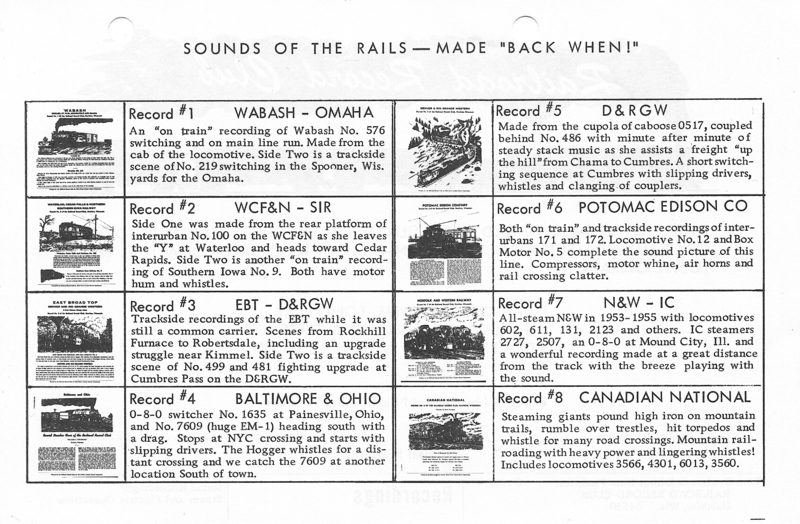 Most records featured steam locomotives, but there were some traction recordings as well. All of these included sounds that were once familiar to all, but were already fast disappearing from the American scene. 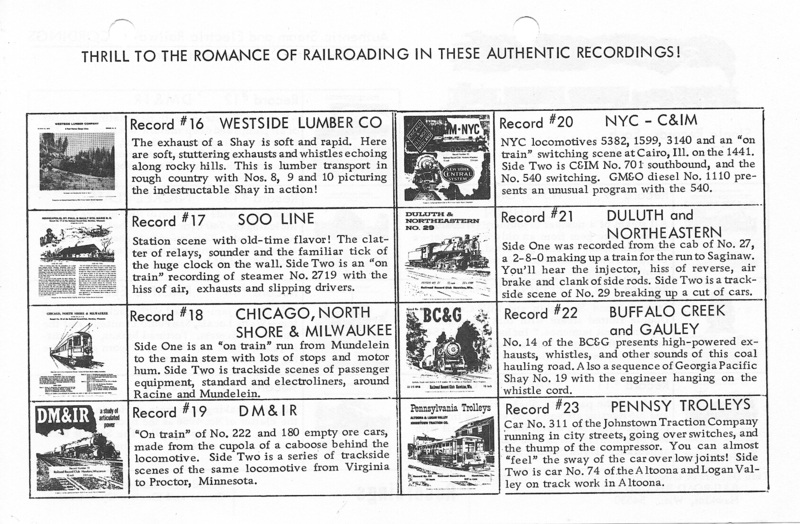 The recordings of the Railroad Record Club are an important part of the historical record, and supplement the films and photographs taken at the time. Eventually, some of the original discs were reissued on 12″. There were also some samplers made. HAWKINS, Wis., March 5 (Special) – The chug-chug of coal burning locomotives pulling up steep grades and the lonesome wail of the steam whistle can still be heard in this Rusk County village. This is despite the fact that Soo Line train engines running through Hawkins have been dieselized for a number of years. These sounds, instead, come from some 200,000 feet of tape recording made by William A. Steventon, manager of the Cream Valley Telephone Co. here. 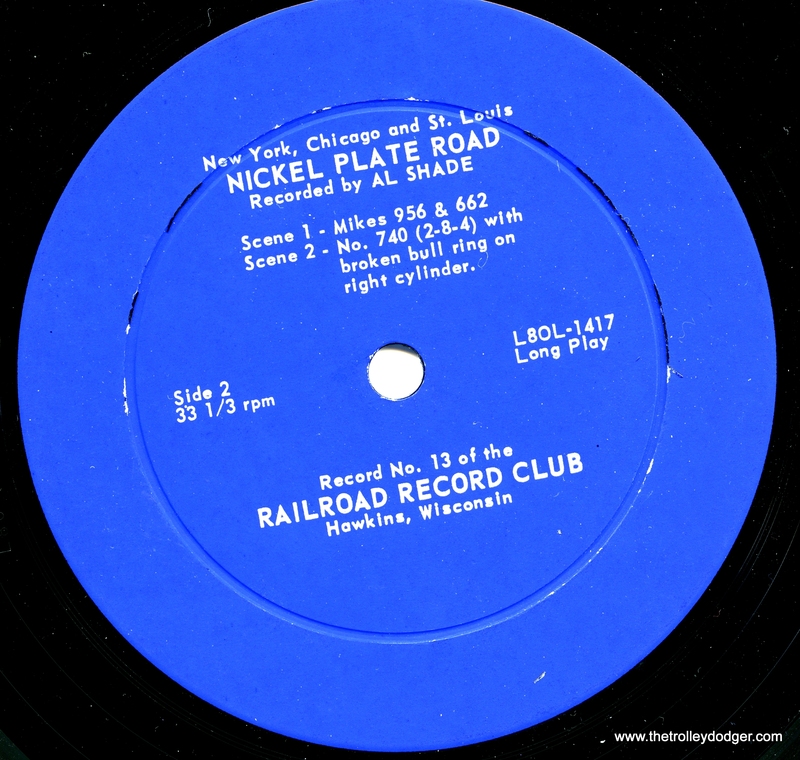 Steventon is the organizer of the Railroad Record Club, which has some 200 members throughout the United States and in several foreign countries. During 1957 he sold 1,000 records in America, New Zealand, Australia, England and Canada. 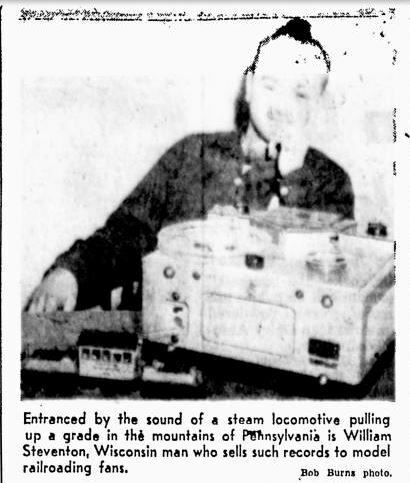 Steventon got into this fascinating sideline in 1953 when his bride-to-be gave him a record of railroad sounds for Christmas. It was of imitation noises, recorded in a studio. This sounds like an unusual gift, until you learn that Steventon is the son of a locomotive engineer and climbed up on a chair to watch the trains go past his home in Mt. Carmel, Ill., as soon as he could walk. He got his first toy electric train when he was four years old. As a teenager in the 1930s, he started building scale model electric trains. Electric trains particularly fascinated Steventon. 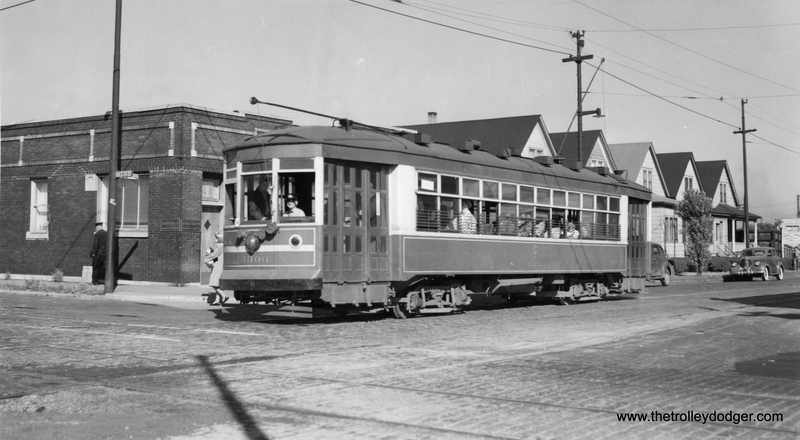 He collected pictures of interurban lines throughout the country, also visiting as many of them as he could. He now has seven complete model train sets and is working on another. He hopes to get into steam locomotives later. When he finishes building his new home east of Hawkins, Steventon plans to set up a system of tracks for his train. When Steventon, working then for the government in Washington, D. C., got the sound recording for Christmas, he decided to record the real McCoy. Since then he has recorded steam and electric trains in 15 states– from New York to California, even in Chicago’s smoky Loop. As you sit in Steventon’s office listening to the huff and puff of the engine and the clickety-clack of wheels over rail joints, you almost feel the sway of the cars. 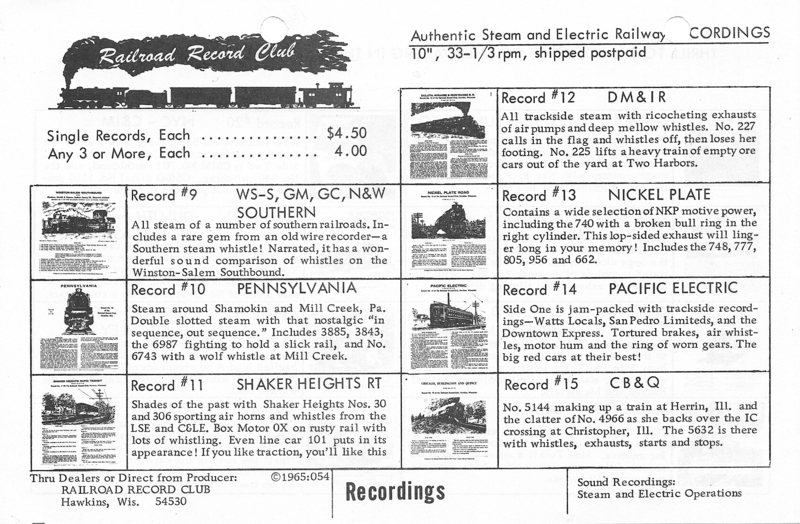 Some recordings offered by Steventon to club members include sounds no longer heard on railroads such as the Illinois Terminal, Johnstown Traction, Potomac Edison, Waterloo, Cedar Falls & Northern, Shaker Heights Rapid Transit, Denver and Rio Grande Western, New York Central and the Duluth, Mesabi and Iron Range. Club members are required to buy three of four records offered each year at a reduced rate. 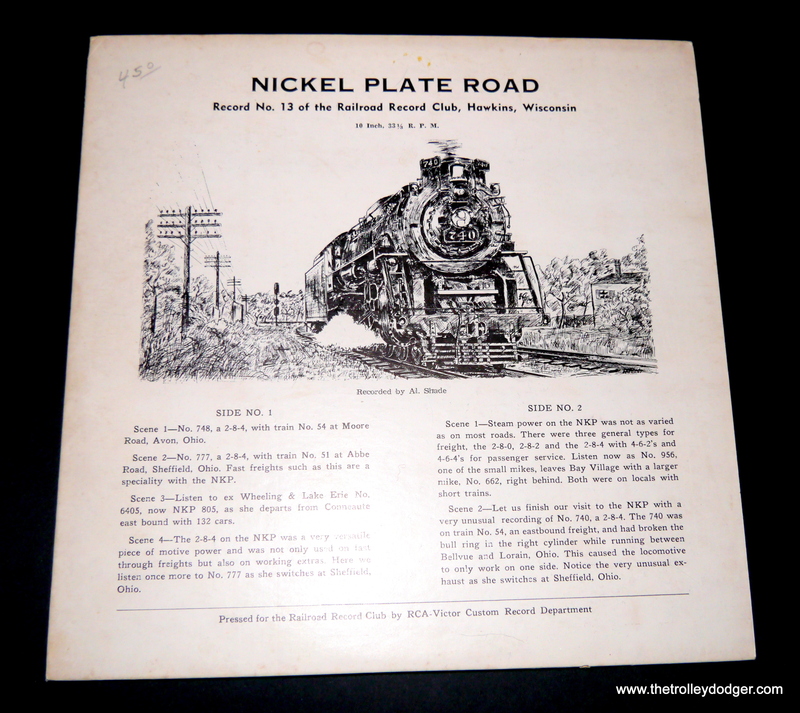 “One side will consist of locomotive switching at Spooner, Wis. Did you ever ride a sleeper and stop at some division point in the wee hours and listen to a nearby switch engine doing yeard work in a misting rain? This is just such a recording. So, it appears Steventon dated the founding of the club to Christmas 1953, although I don’t think any records were issued before 1955. 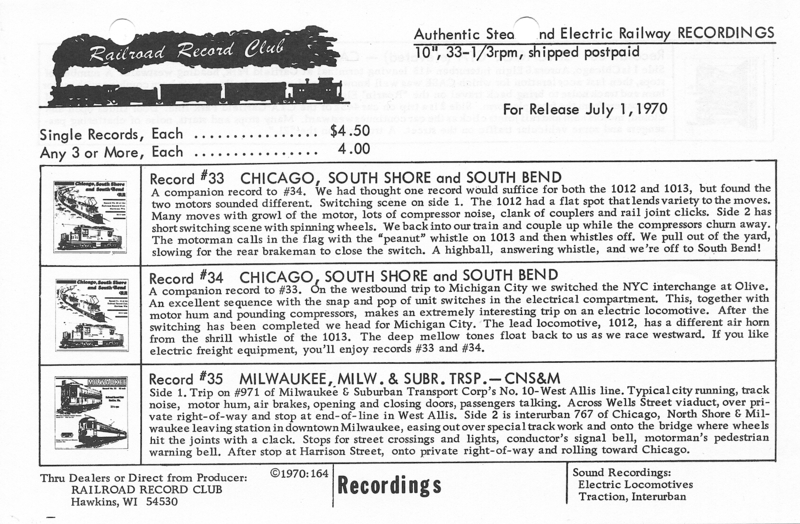 The first introductory record was unnumbered, and the ones that followed ran from 1-36. There were at least six special pressings in the early 1970s, and various samplers that presumably gave club members and record dealers some idea of what they could order each year. Some records were reissued in 12″ format, and the club seems to have kept going until around 1986. Here is what I assume to be a more or less complete Railroad Record Club discography. As far as I know, this is the first and only such discography that you will find online. As it turns out, I acquired a bunch of recordings many years ago and still have my copy of that Club’s 1965-1970 catalog. Scans are attached. The detailed description of each record should help you to fill in any gaps. You’re welcome to share these images through your blog. I recall Bill Steventon’s apology for having to raise the price of all 10″ records to $4.00 (postpaid)! In those days the price increase seemed steep because I was earning only $3.00/hour. 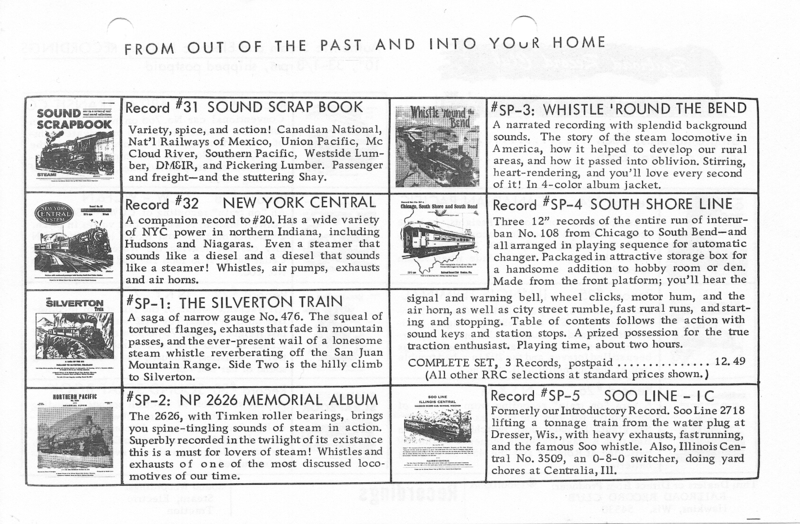 I also saved several Record Club newsletters from various years up to 1986 and a 1971 catalog from Mobile Fidelity Records, which produced the original Interurban Memories album. 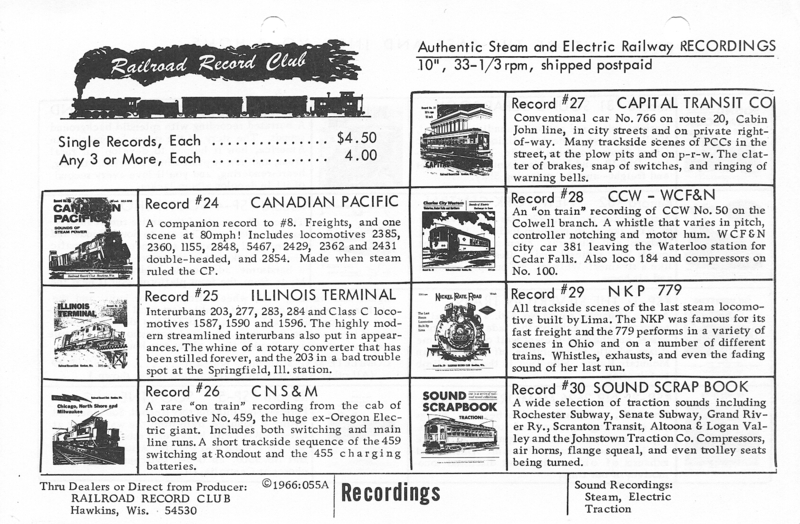 All-Nation Hobby Shop once had a “record department” which sold RR sound recordings from several sources. “Traction Ted” Seifert was in charge of this. PS- You can now purchase some of these historic recordings on compact disc through our Online Store. We also posted a follow-up article about the RRC that you can read here.